This tutorial was originally published in February 2012 as a Tuts+ Premium tutorial. It is now available free to view. 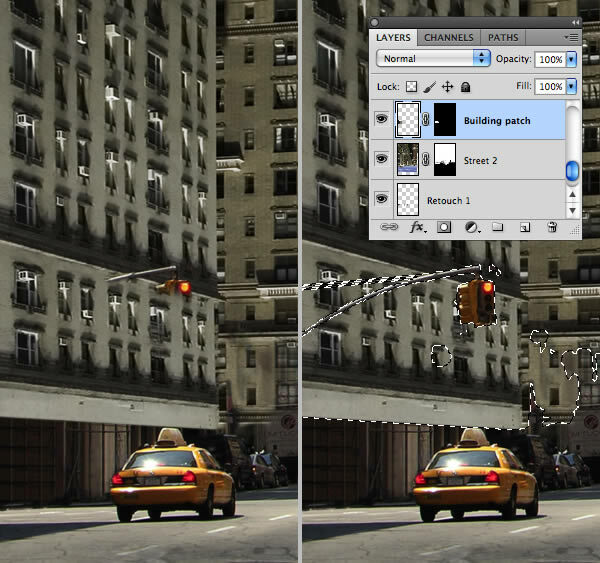 Although this tutorial does not use the latest version of Adobe Photoshop, its techniques and process are still relevant. 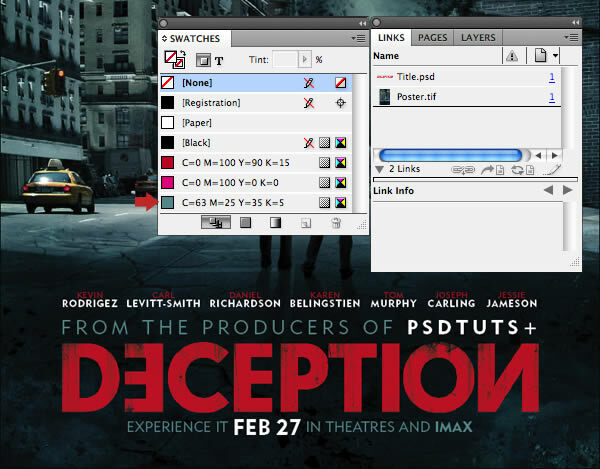 In this tutorial will take inspiration from the Inception movie of a few years ago. 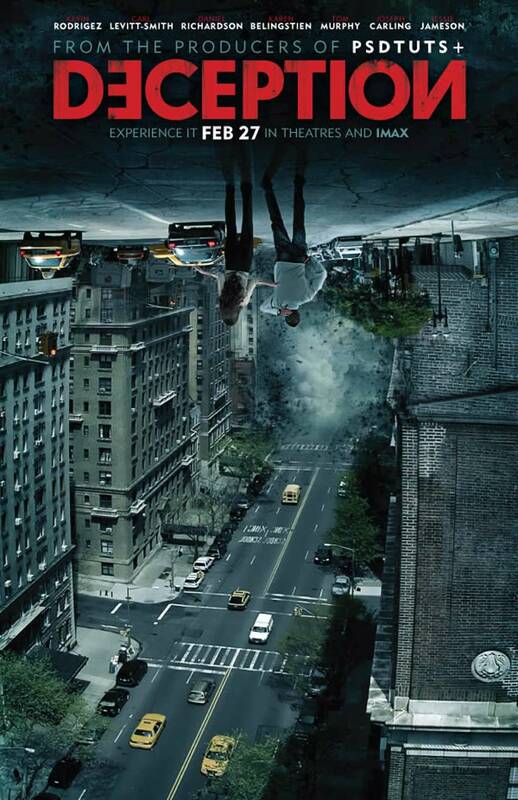 The film used breathtaking special effects to create a world of impossible reality. This concept is by no means new, in fact the most well-known illusions of reality were created almost a century ago by the Dutch graphic artist Escher. His woodcuts and lithographs featured impossible constructions, explorations of infinity, architecture and tessellations. 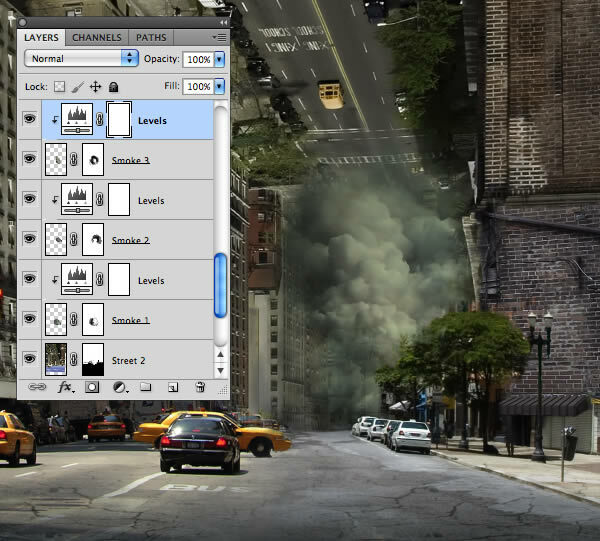 As far as techniques go, I’ll show you how to combine multiple images with advanced masking and blending techniques to create an impossible city. 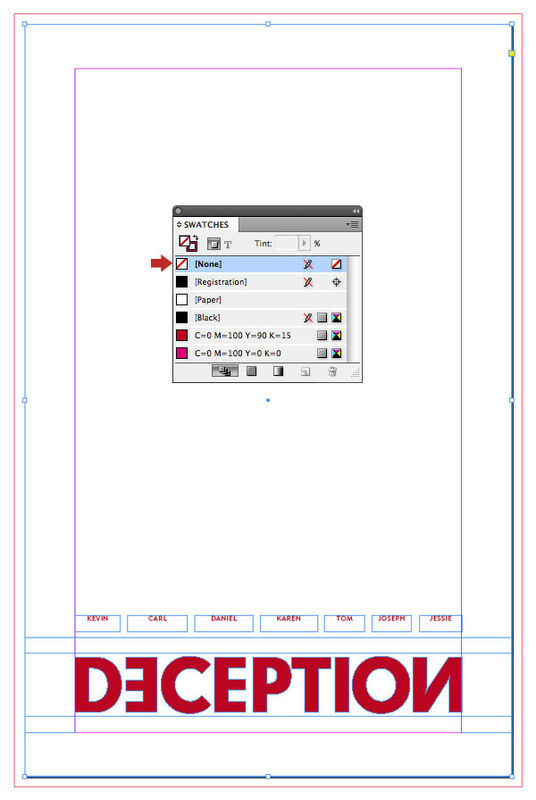 You’ll also use InDesign to create a template, as well as producing error-free artwork. 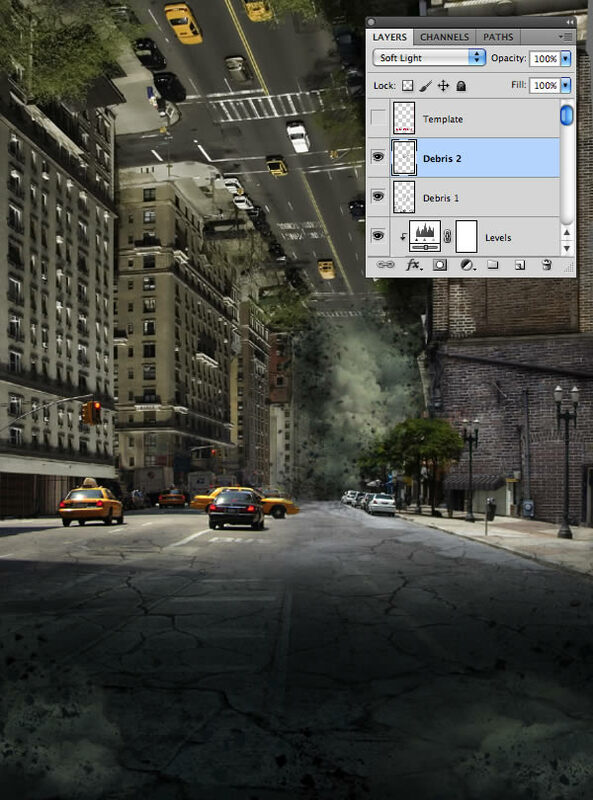 Love cinematic effects? Create awesome posters of your own using our amazing Cinematic Photoshop Actions available through GraphicRiver. Or enlist the help of a professional from ThemeKeeper Studio for all your design needs. The following assets were used in the production of this tutorial. Note: Some of these resources have been updated with similar, working links, feel free to use your own. 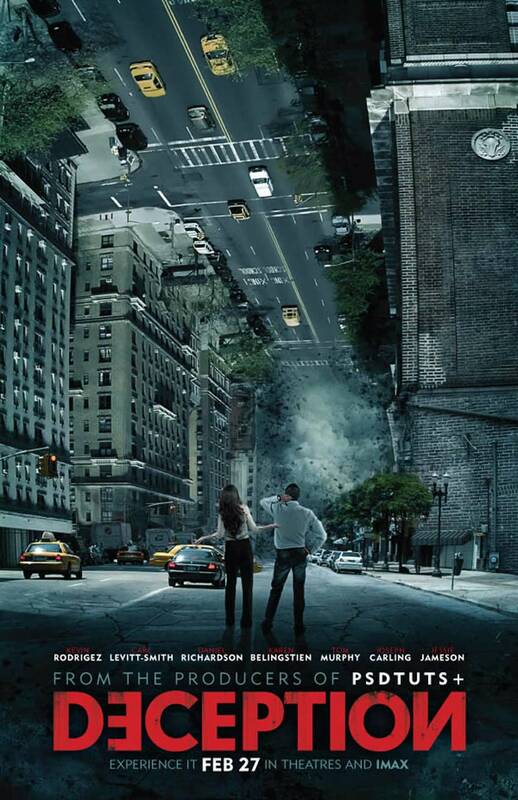 All movie posters are designed to a range of standard sizes. For the purpose of this tutorial, we’ll work at half size to keep the layered Photoshop file at a manageable size. 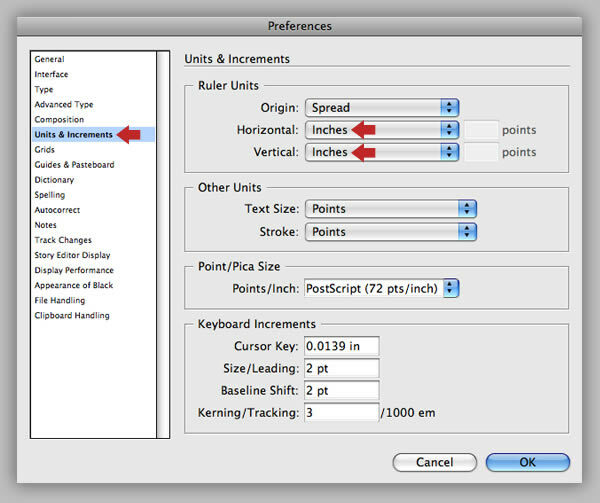 Launch InDesign, then go to InDesign > Preferences, highlight Units & Increments, then change the Horizontal and Vertical Ruler Units to Inches and click OK. 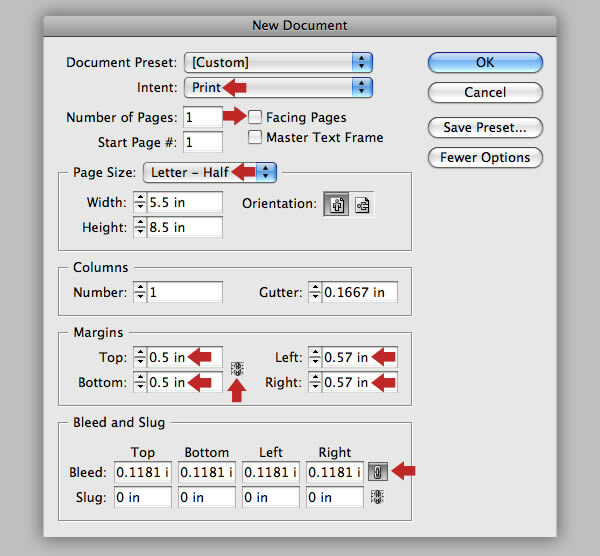 Create a new InDesign document, set the Number of Pages to 1, select Letter-half from the Page Size pull-down menu, then uncheck the chain icon in the Margins box and enter 0.5 in for the Top and Bottom and 0.57 in the Left and Right fields. We need an equal amount of bleed all round, so activate the Chain icon in the Bleed and Slug box and key in 3mm, which will automatically be converted to inches. Choose New Color Swatch from the fly-out menu situated top right in the Swatches tab. In the following window check Name with Color Value and choose Process under Color Type, CMYK under Color Mode and set the Magenta slider to 100%. Your new swatch will now appear at the bottom of your current swatch list. Set the Reference Point Locator in the Options bar to Top-right. Select the Rectangle Tool (M) and Snap a box to your document edge (not bleed). Open the Color tab and give the box a fill of 50% Black and a 0.5pt Magenta Stroke. Now adjust the Width and Height values in the Options bar if required to match the document size. With the box active hit Control-L to Lock its position. Grab the Type Tool (T), snap a text box to the document width and place it near the bottom. Choose a chunky sans-serif font (I used Geometric 706 Black), enter the movie title, then press Shift-Control-C to centre it within the text frame. Now color the text with a new red swatch (C=0, M=100, Y=90, K=15). It’s vital when using large font sizes to adjust the spaces between individual characters. This is called kerning and should not be confused with tracking which adjusts the spacing between whole words. To adjust Kerning, click between each character pair in turn with the Text Tool, then hold down Alt and tap the Left or Arrow key to tighten the space shown in the Character tab. You may wish to revist InDesign’s Units & Increments Preferences and set the Keyboard Increments Cursor Key to 0.0139 for smaller increment jumps. You’ll see that I’ve tightened up the spacing between each character by eye for a pleasing result. When you’re happy, Resize the text to meet the vertical guides. Add more text in separate frames above and below the main title in white. I used Geometric 415 Lite and Black. Adjust the Tracking and emphasize the release date by making it bigger and applying a small amount of baseline shift. Place the first actor’s name in a new text frame, then click the Fit Frame to Content button in the Options bar. Use the same process to add the remaining names, then use Smart Guides (Control-U) to distribute them equally as shown. Next, we need to create separate paths for the movie title in order to flip certain characters. Grab the Selection Tool (V) and activate the title text frame. Press Shift-Control-O to Create Outlines, then press Alt-Shift-Control-8 to Release Compound Path. 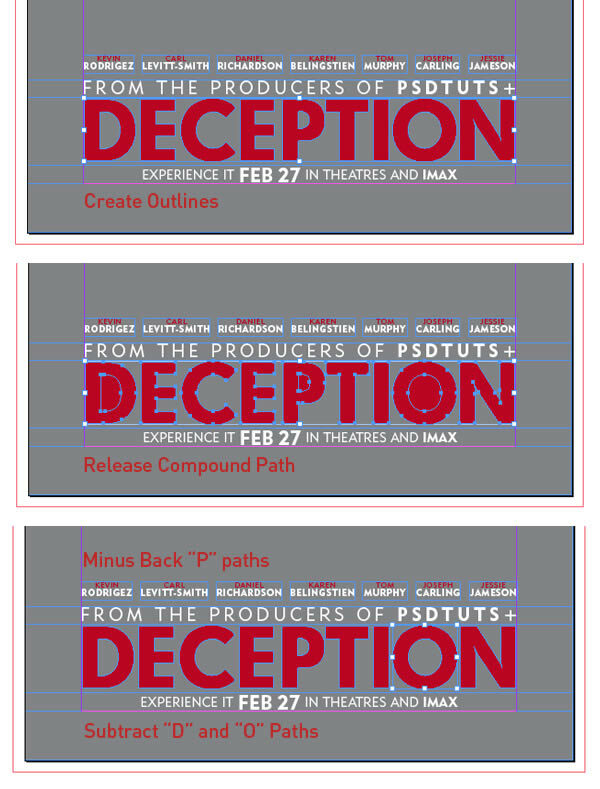 Now use the Direct Selection Tool (A) to select both paths of the “P” and choose Object > Pathfinder > Minus Back. Next, select both “D” paths and use the same menu to choose Subtract. Repeat the Subtract command on the “O” paths. Center the dot in Reference Point Locator, then select the first “E” and click Flip Horizontal in the Options bar. Repeat this for character “N”. Press Alt-Control-L to Unlock All and set the Fill of the stroked box to None. That’s the basis if our InDesign artwork complete. 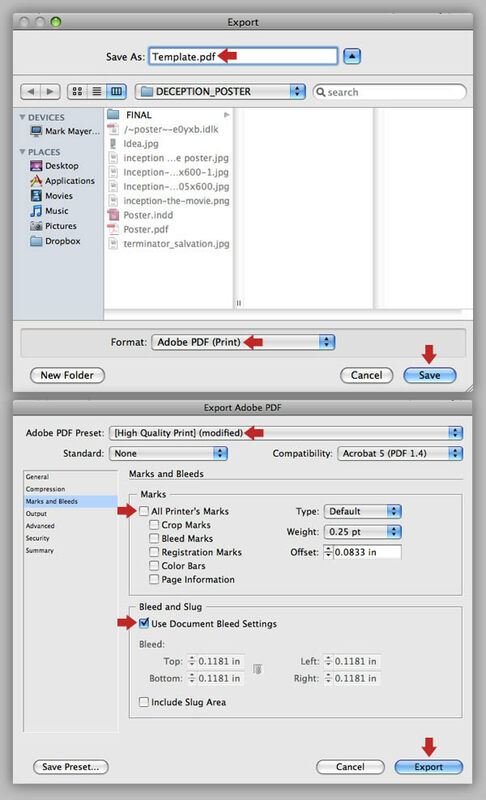 In this step we’ll create a PDF to use as a template for Photoshop. Hit Control-E to access the Export window. Be sure to save it to a memorable location, name it “Template”, click Save, then Copy these settings in the following window and hit Export. 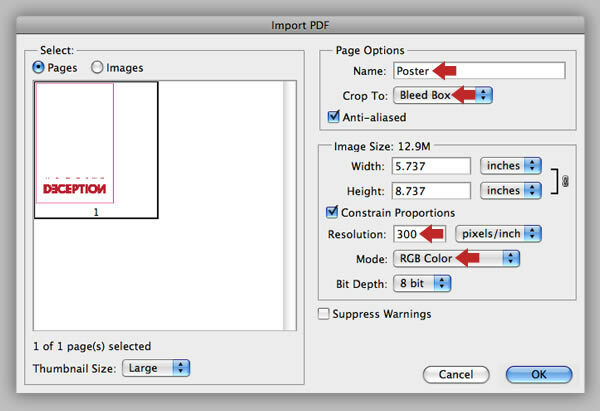 Import your PDF via Photoshop, name it “Poster” and use the following settings. Rename the default layer “Template”, then place a New Layer called “Grey fill” below it. Now press Shift-F5 and select 50% Gray at 100% Opacity. 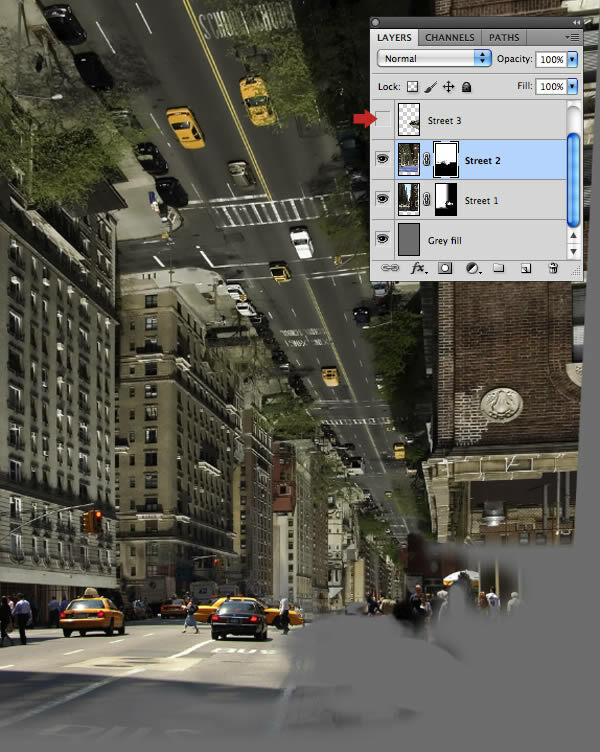 Open the first city photo and Double-click the layer thumbnail to release its transparency. For the illusion to work and to blend the buildings together successfully, we need to correct the left vertical perspective (the right side is irrelevant as it will be hidden). Place a guide along the edge of the tower block as shown, grab the Move Tool (V) and activate Show Transform Controls in the Options bar. Now press Control and pull the corner points until the building aligns to the guide. When you’re happy, hit Return to commit the transformation. 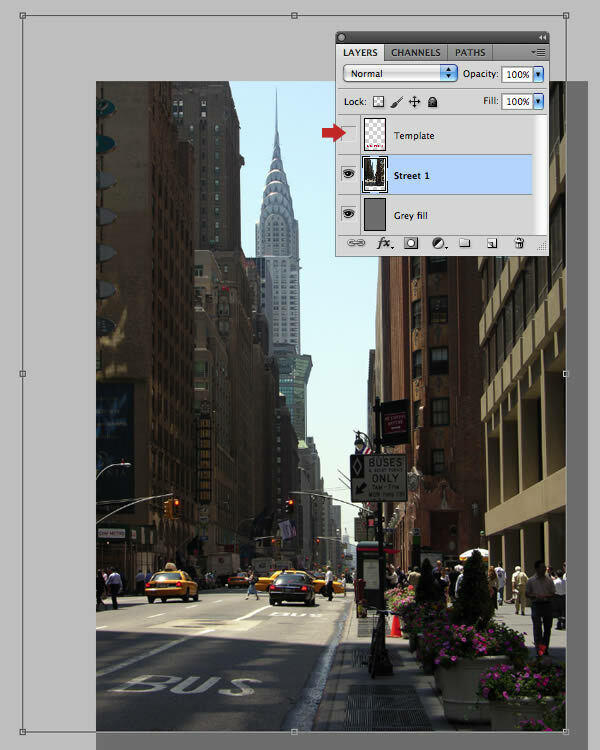 Drag the layer into your working file above the “Grey fill” and label it “Street 1”. Toggle the Visibility of the “Template” layer and Transform so it just falls short of the right and bottom edges. Open the second city image and repeat the same steps to fix the left and right vertical Perspective as we’ll be using the entire image. 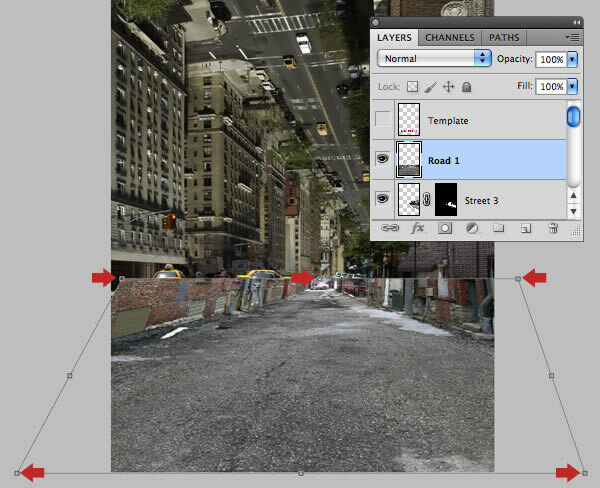 Place as a New Layer above “Street 1”, then use the Transform menu to Flip Vertical and Flip Horizontal. 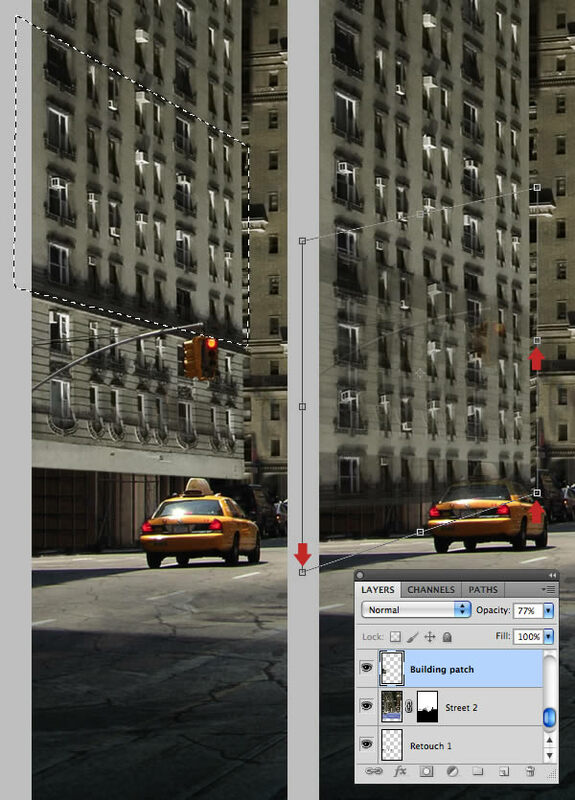 Reduce the layer Opacity to around 50% to help you Resize and position the building structure to the underlying layer. 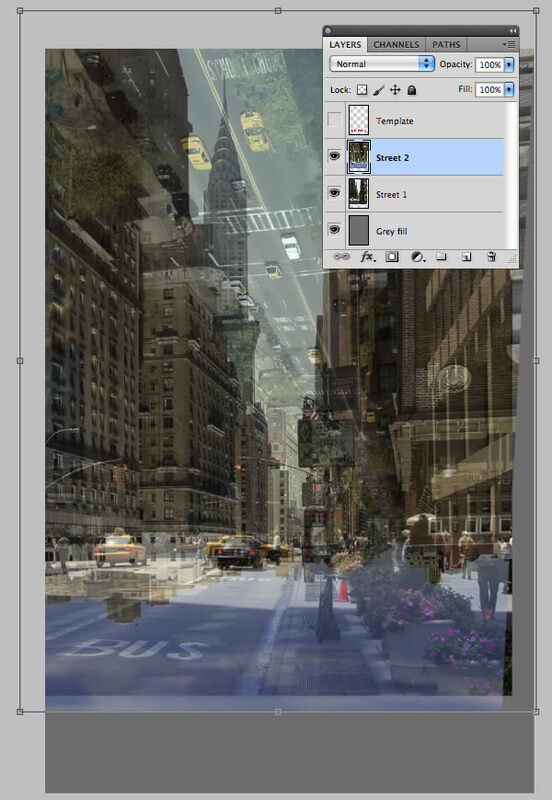 When you’re done, set the Opacity back to full strength and name the layer “Street 2”. 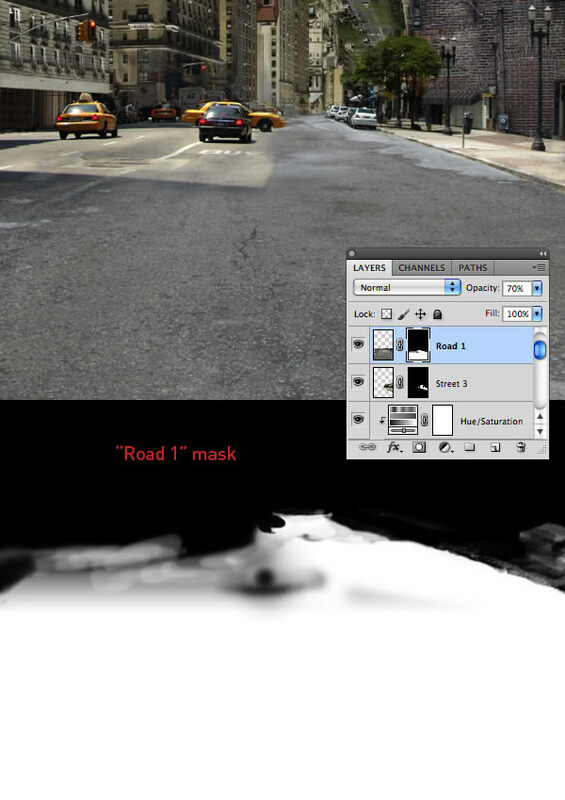 Disable the Visibility of the “Street 2” layer, then add a Mask to “Street 1”. Press D to reset your Foreground Color to black. 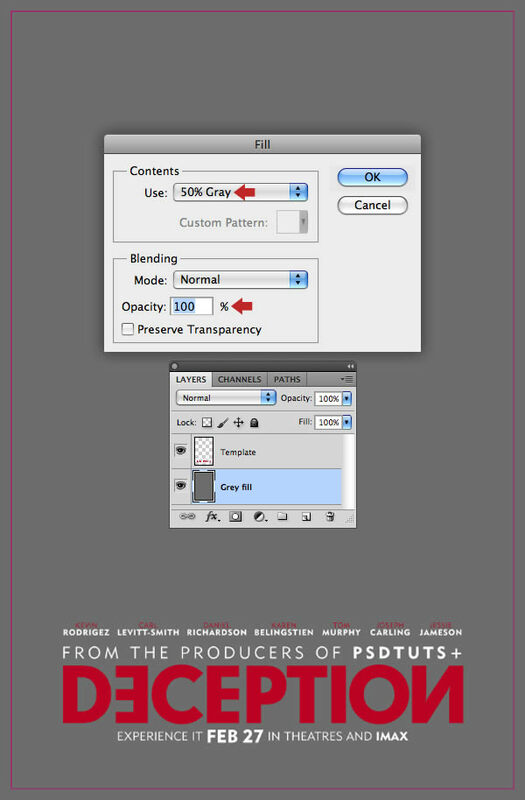 Set the Gradient Tool (G) to Foreground to Transparent and choose Linear from the Options bar. Now press Shift and drag two gradients on the mask as shown. Enable the Visibility of the “Street 2” layer, add a Mask, then Shift-drag another Linear Gradient to hide the bottom quarter. 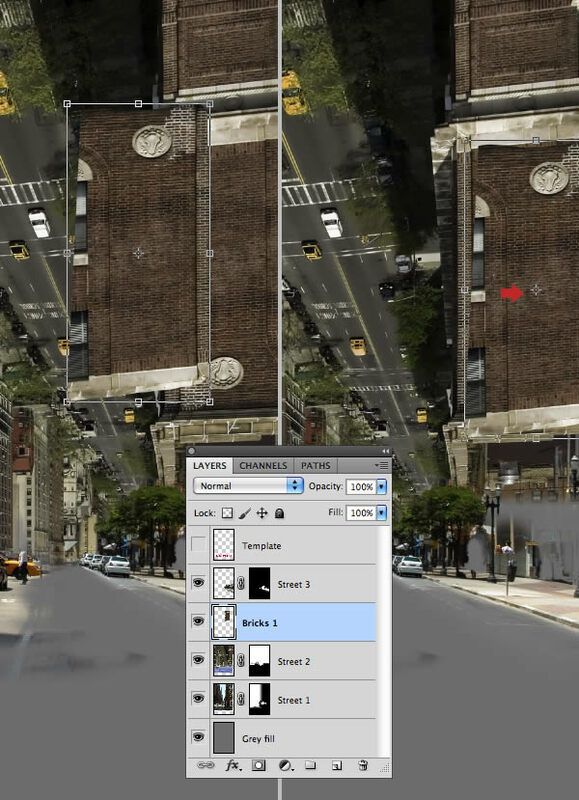 Open the third city image, then use the Lasso Tool (L) to roughly select the area as shown. 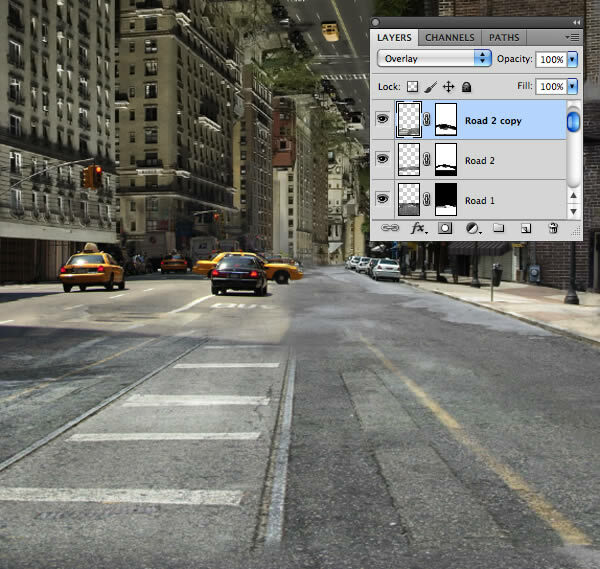 Copy > Paste as into your working file, Resize, position to the right and name it “Street 3”. 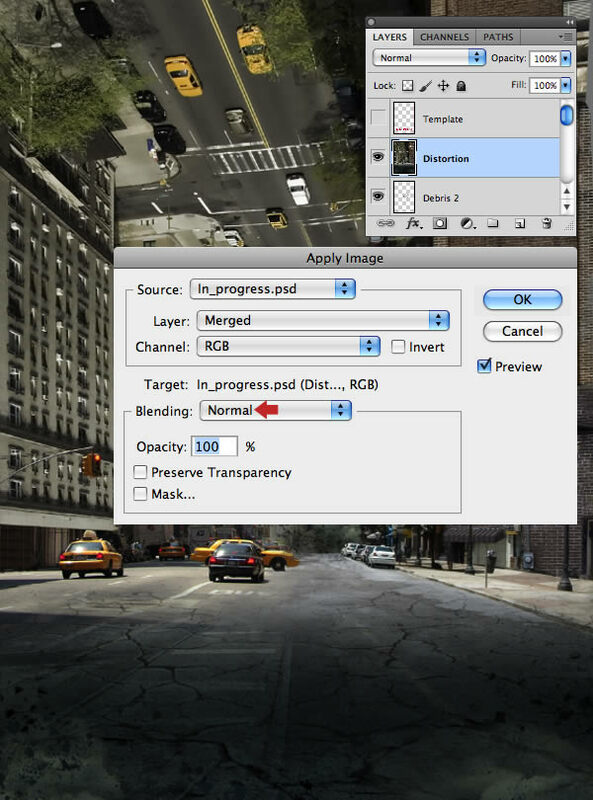 Disable the Visibility of the “Street 3” layer. 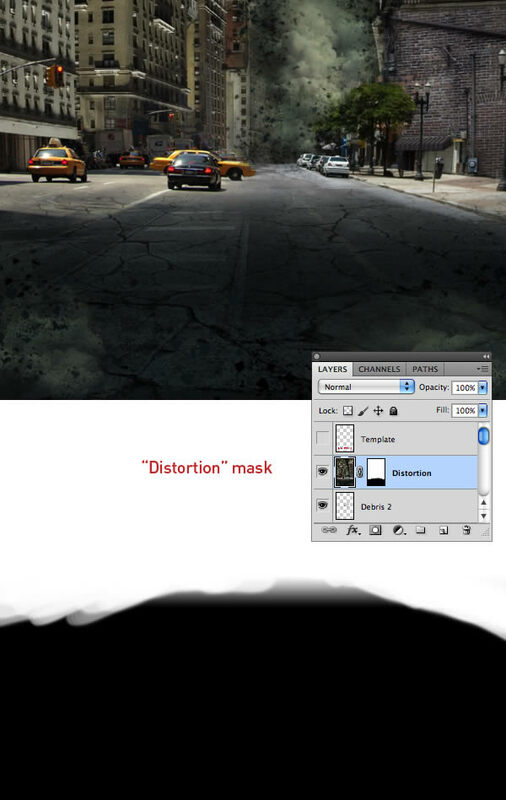 Now use a selection of Hard and Soft Brushes refine the two lower street masks. This stage requires some time and a little patience to seamlessly blend the two images together. 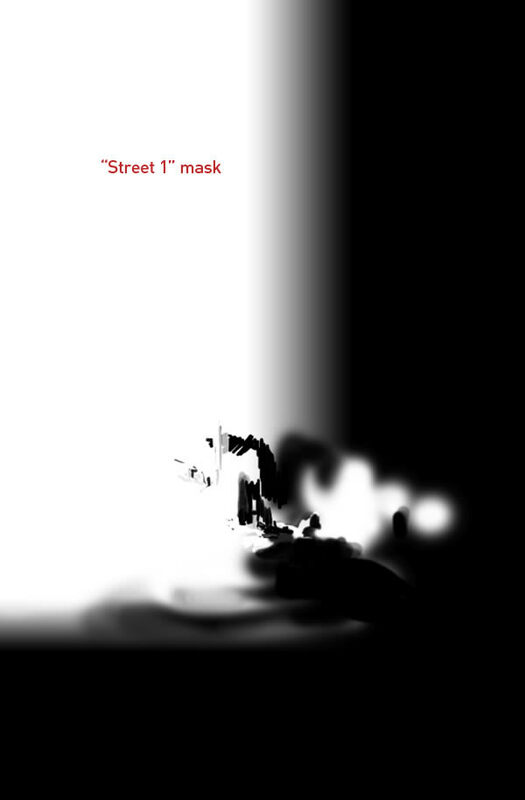 Your “Street 1” Mask should look something like this. And your “Street 2” Mask something like this. 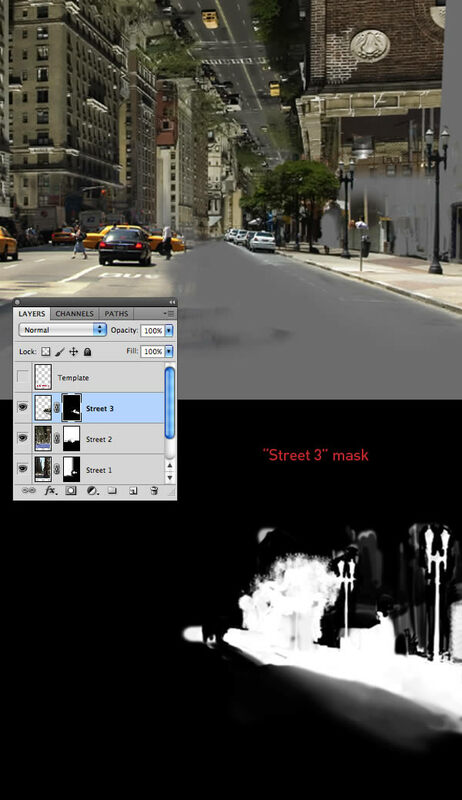 Switch the Visibility of the “Street 3” layer back on. Add a Mask, but this time press Control-I to Invert the mask to black. Now use an assortment of white Brushes to paint back the areas as shown. The upside down brickwork on the right looks a little odd. 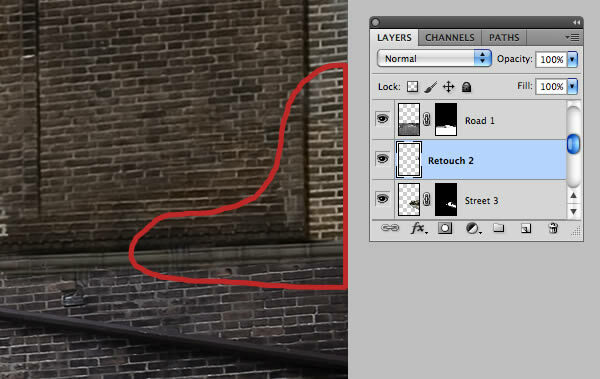 To fix this, target the “Street 2” layer, then use the Polygonal Lasso (L) to select an area of bricks. Now press Control-J to Copy the selection to a New Layer, Rotate it 180 Degrees and reposition as shown. Name this layer “Bricks 1”. 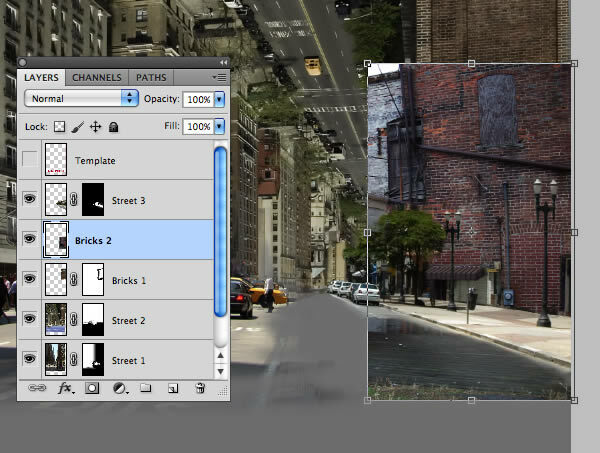 Add a Layer Mask, then carefully blend the hard edges into the underlying brickwork. The right side of the composition still needs more detail, so open this building and use the Rectangular Marquee Tool (M) to select the right half and Copy > Paste below “Street 3”. 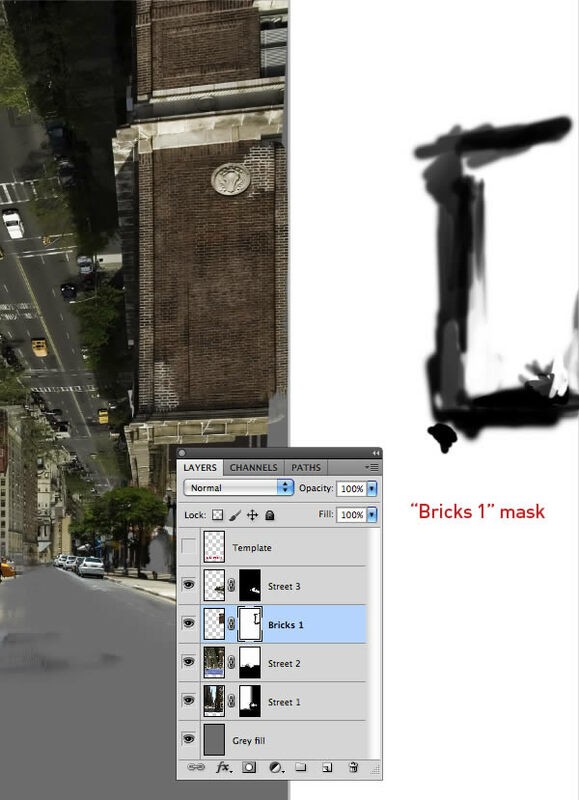 Name this layer “Bricks 2”, then Transform and position as shown. Add an Inverted Mask to this layer, then paint with white, then black so your mask looks something like this. Target the “Bricks 1” layer thumbnail, then choose Hue/Saturation from the drop-down Adjustment Layer icon at the foot of the Layers tab. In the next window click the double-ring icon to Clip it to the “Bricks 1” layer and reduce the Saturation to -32. 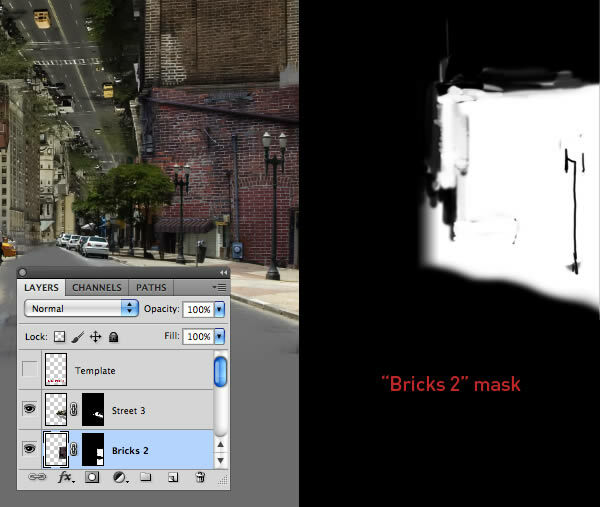 Use the same technique to Clip another Hue/Saturation Adjustment to the “Bricks 2” layer. Set the Master Saturation to -46 and the Reds to -42. In this step we’ll remove the background figures. 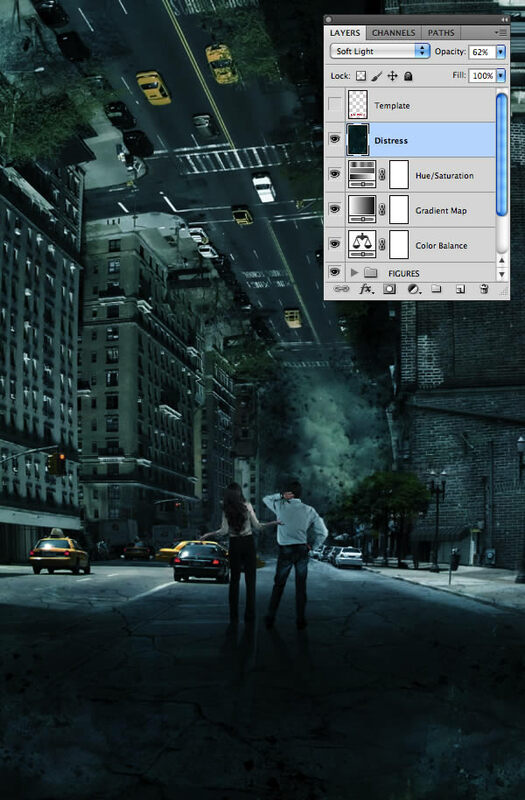 Add a New Layer above “Street 1” and label it “Retouch 1”. 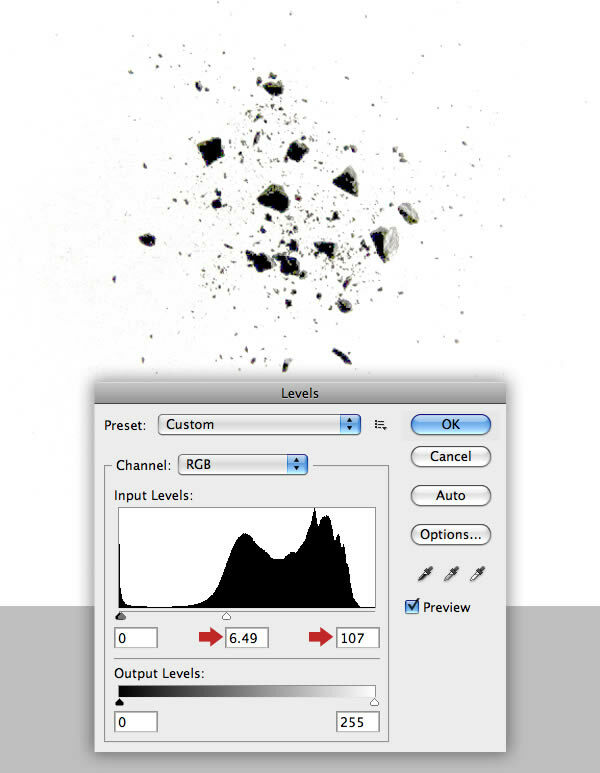 Set the Clone Stamp Tool (S) to Current & Below and use a small brush at around 50% Hardness. 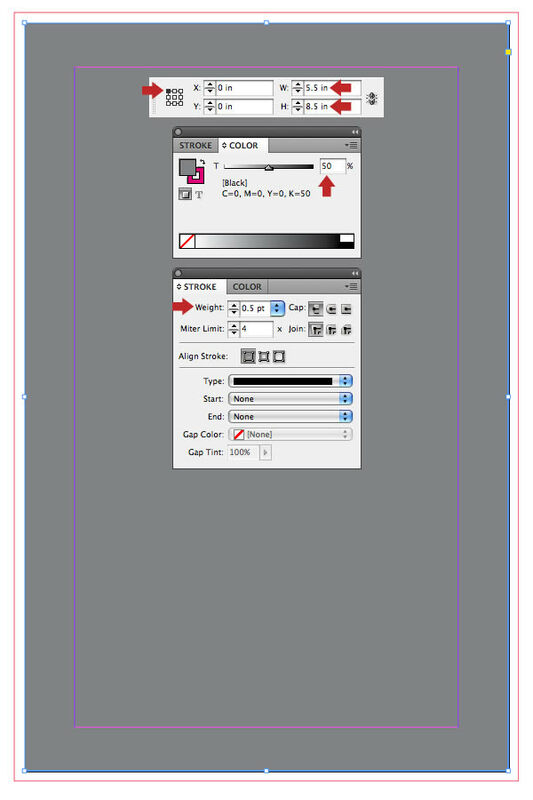 My retouching layer is shown in isolation at the bottom of the screenshot for clarity. 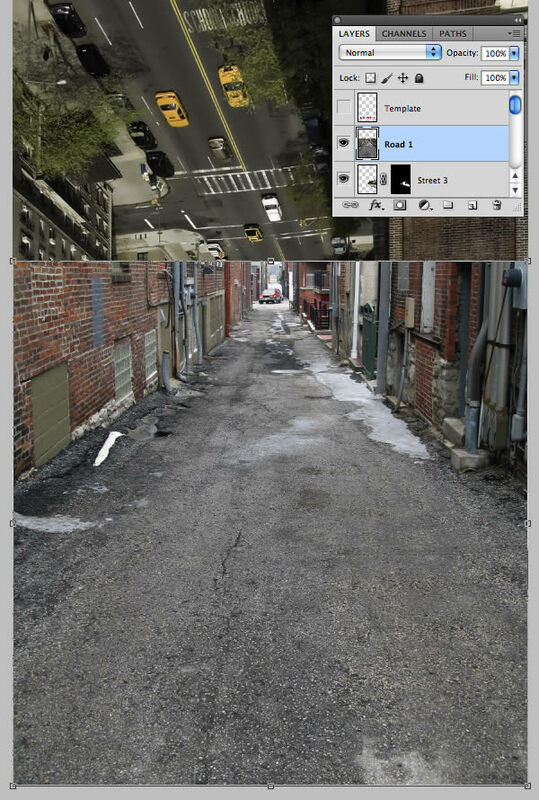 Open the back ally photo and select the bottom half with the Rectangular Marquee Tool (M), then Copy > Paste as a New Layer above “Street 3”. Position at the bottom of the canvas and name it “Road 1”. Squash the layer content, then hold down Control and pull the control handles until it looks something like this, then hit Return to commit the transformation. 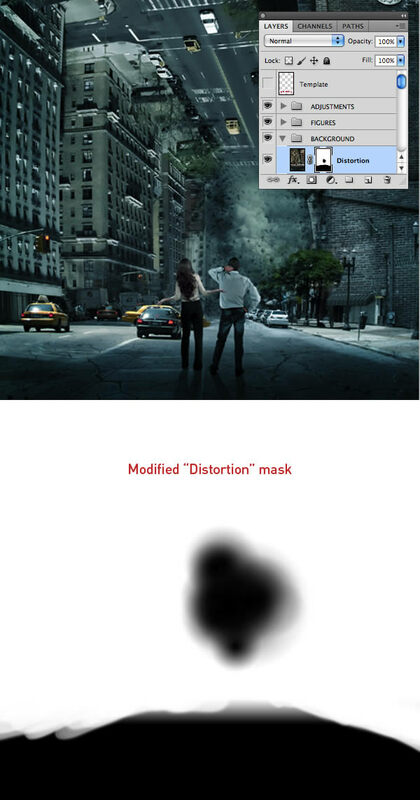 Now reduce the layer’s Opacity to 70% and the Mask as shown. 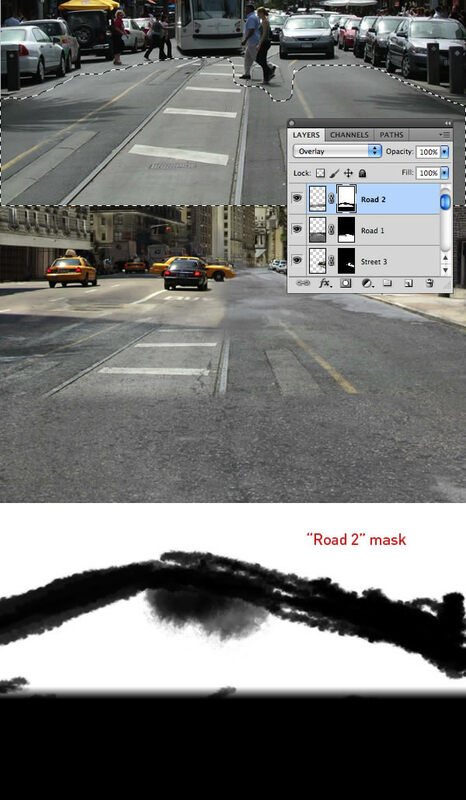 Use the Lasso Tool (L) to select the base area from this street and Copy > Paste above “Road 1”. 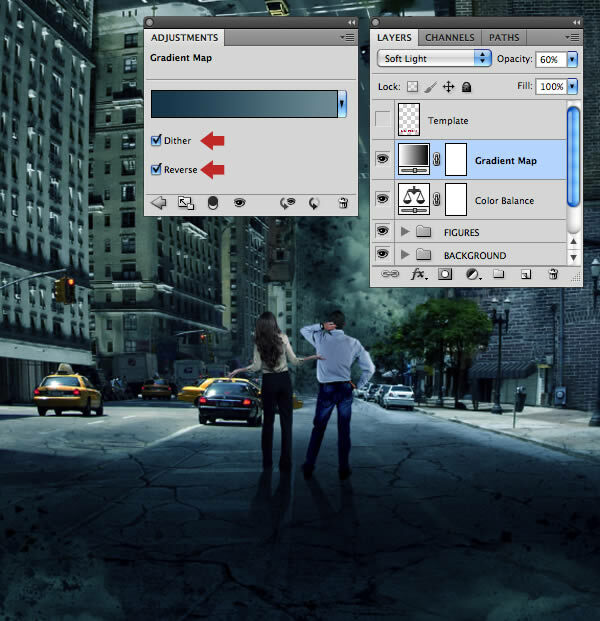 Name this layer “Road 2”, then use the same technique as before to match the perspective. Now change the Blend Mode to Overlay and Mask as shown. 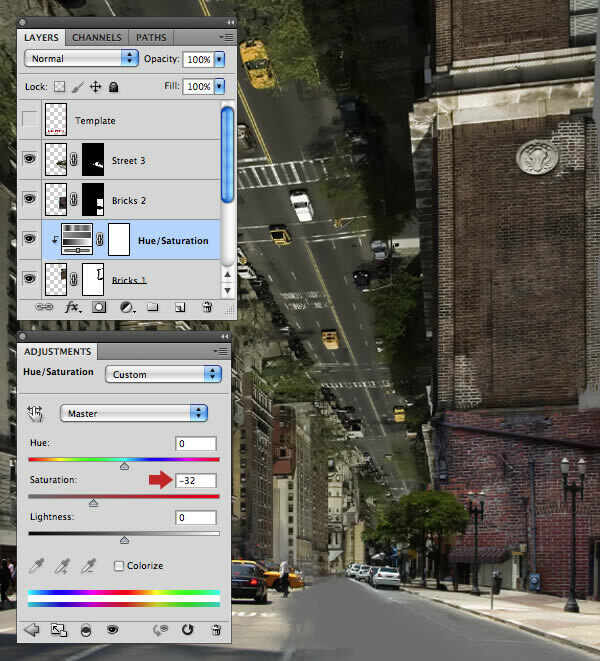 Duplicate the “Road 2” layer, enlarge from the center out and move to the bottom of the canvas. 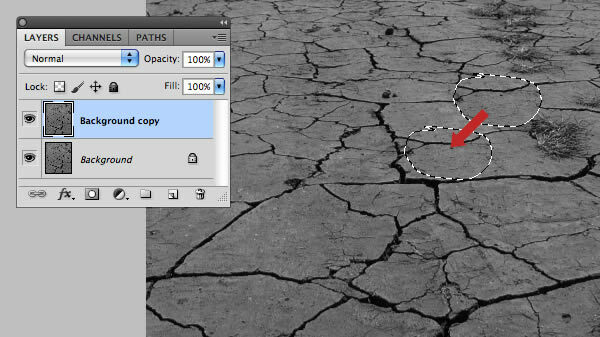 Open the cracked earth photo and press Shift-Control-U to Desaturate, then Duplicate the “Background” layer. Grab the Patch Tool (J) and remove all the clumps of grass. Working on a duplicate layer preserves the original file, just in case things go wrong. Once you’re happy, hit Control-E to Merge Down the top layer. 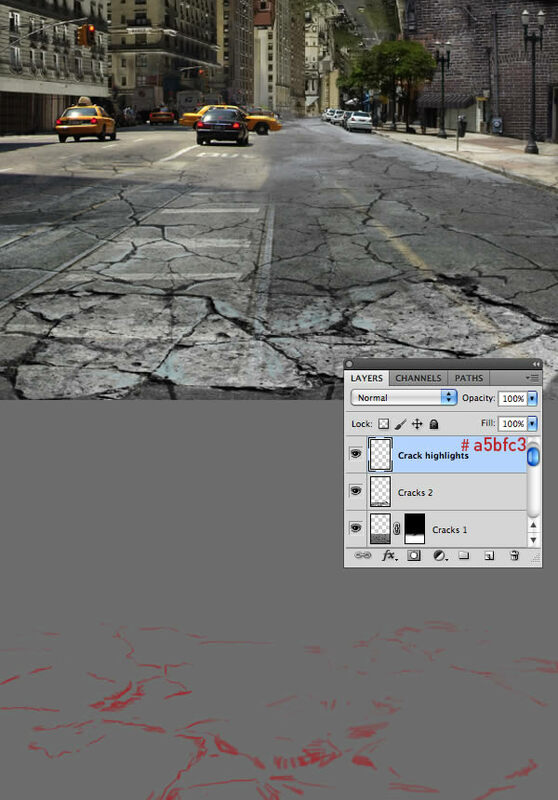 Add the retouched file above the “Road 2 copy” layer and label it “Cracks 1”. Change the Blend Mode to Multiply to render the lighter pixels invisible and reduce the Opacity to 71%. Squash and distort to match the perspective as before, then Mask with a Linear Gradient (G) as well as painting manually. 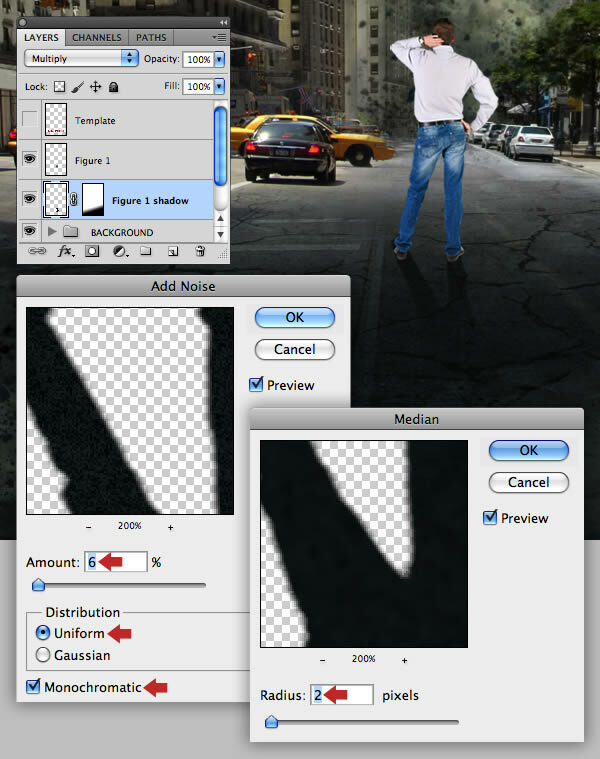 With the Lasso Tool (L) create a rough Selection from a cracked concrete photo. Copy > Paste above “Cracks 1” and name it “Cracks 2”. Position in the foreground, then change the Blend Mode to Hard Light and Distort as shown. Place a New Layer above “Cracks 2”, then sample a pale blue (#a5bfc3). Now paint with a small, Soft Brush to accentuate the cracked highlights on the road. I’ve indicated these brushstrokes in red at the bottom of the screenshot for clarity. Set your Foreground to dark blue (#132227), then add a New Layer below the “Template”. Now Shift-drag a Foreground to Transparent Linear Gradient up from the bottom. Toggle the Visibility of the “Template” layer to help determine how deep to make the gradient. To break up any banding on the gradient, first, go to Filter > Noise > Add Noise. Set the Amount to 10%, then check the Uniform and Monochromatic options. Next, choose Median from the same Noise menu and enter 2px to soften the effect. 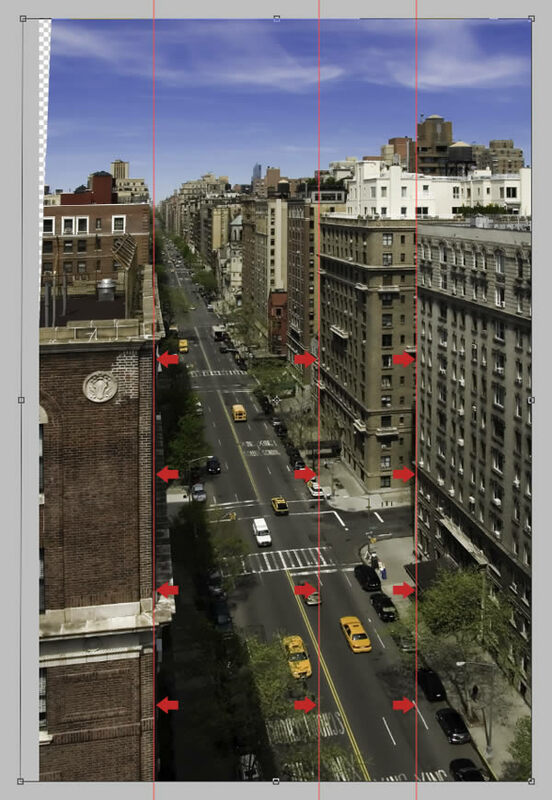 Examine your composition for any missing areas around the edges. 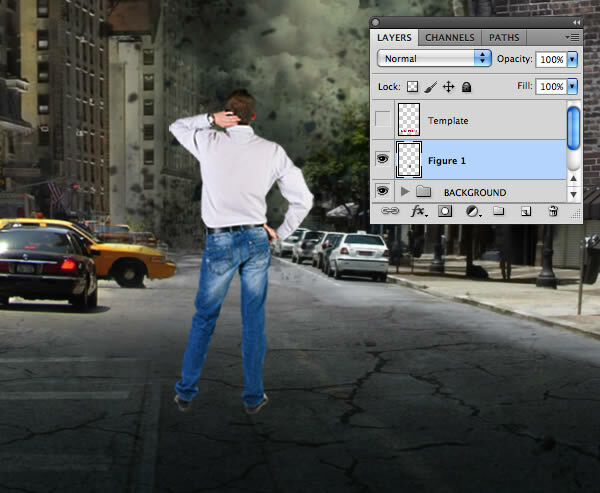 Use the same Cloning technique on a New Layer above “Street 3” to repair them. Now we’ll add some clouds of dust. Open the industrial scene, then press Q to enter Quick Mask Mode. Now paint over the main area of smoke with a medium, soft-edged brush, Press Q again to exit Quick Mask Mode, then hit Shift-Control-I to Inverse the selection and Copy to the Clipboard. 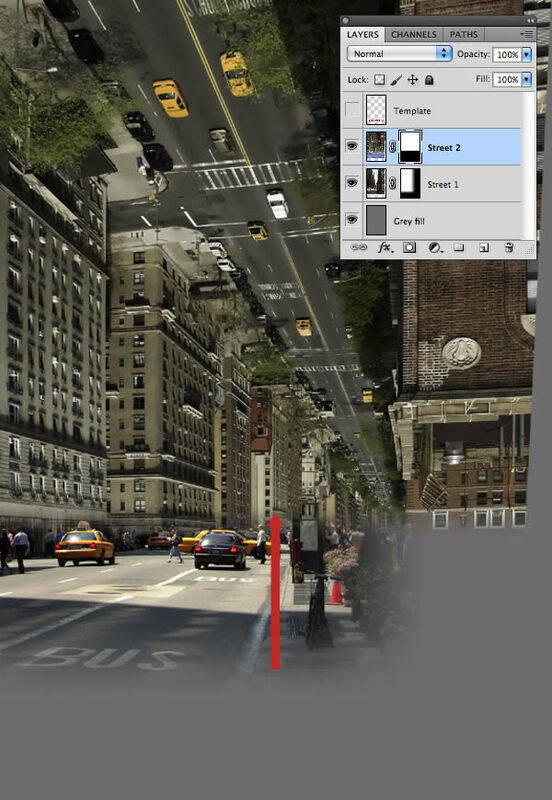 Paste above the “Street 1” layer, place centrally on the horizon line and Resize as shown. 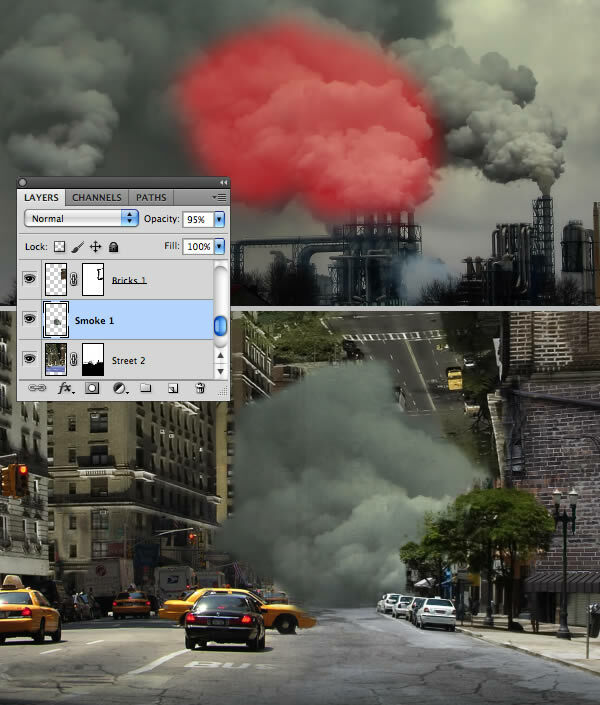 Reduce the Opacity slightly to 95% and name the layer “Smoke 1”. 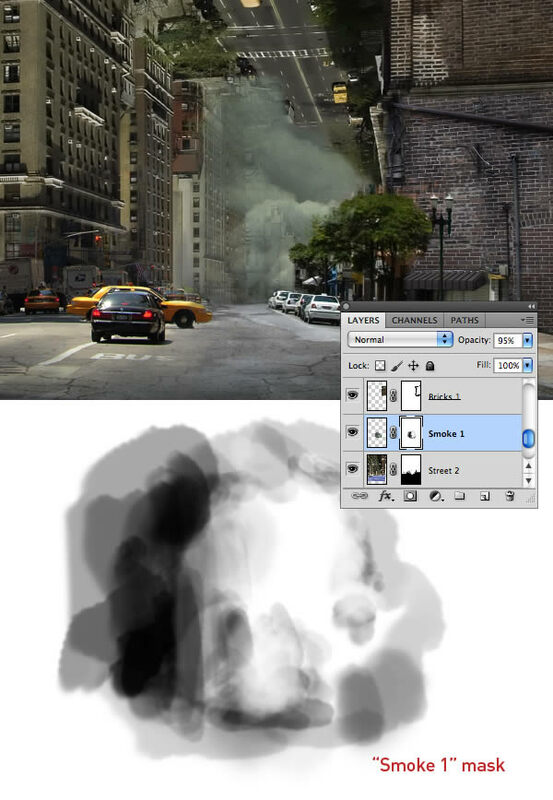 Add a Layer Mask to “Smoke 1”, then use an assortment of Brushes to blend the edges into the composition. Clip a Levels Adjustment to “Smoke 1” and Copy the following settings. Repeat this workflow to add more smoke from the same source file to build up the density, then label them accordingly. At this stage I felt the bottom-left windows looked a little out of place. 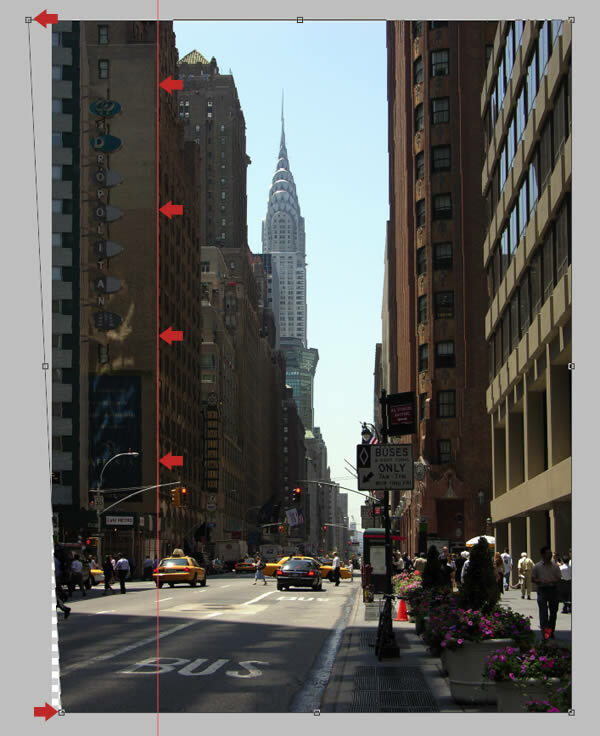 To fix this, target the “Street 2” layer thumbnail, then use the Polygonal Lasso Tool (L) to select the portion of building directly above the problem area. Press Control-J to Copy the selection as a New Layer and name it “Building patch”. 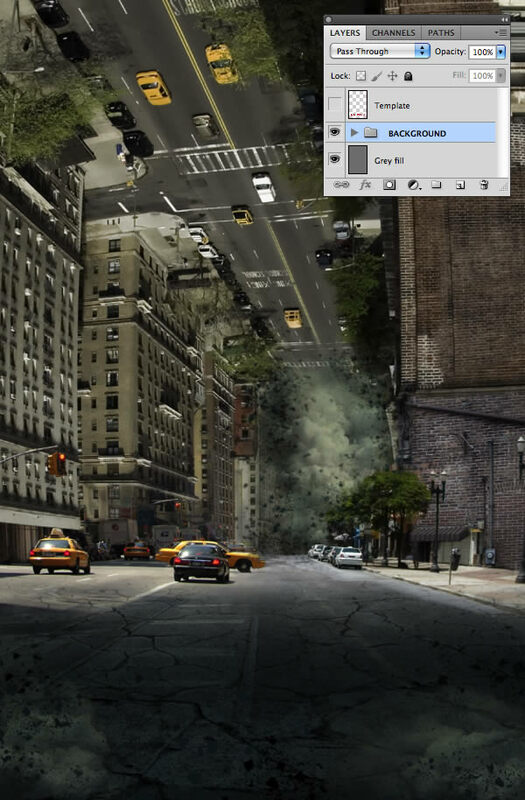 Move it into position, temporarily reduce the Opacity slightly, then Transform it to match the perspective. Add an Inverted Mask, then use a white Brush to reinstate the windows. 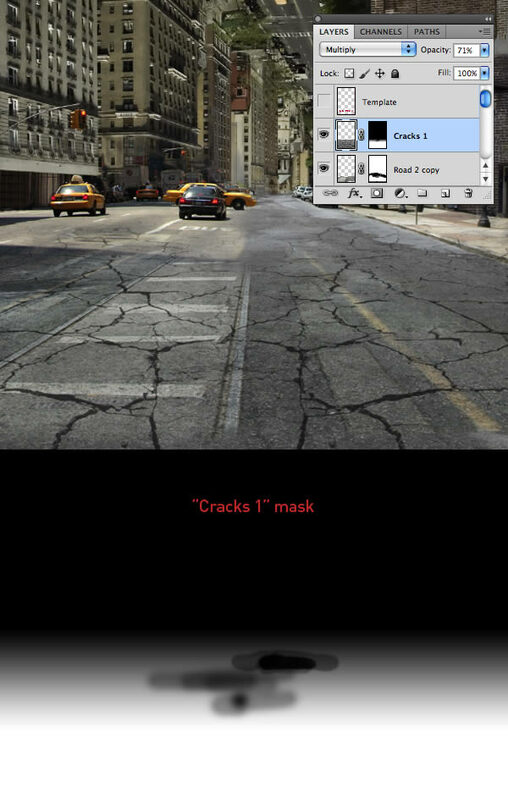 Control-clickyour “Street 2” mask thumbnail to load white as a selection and hit Control-I to Inverse it. 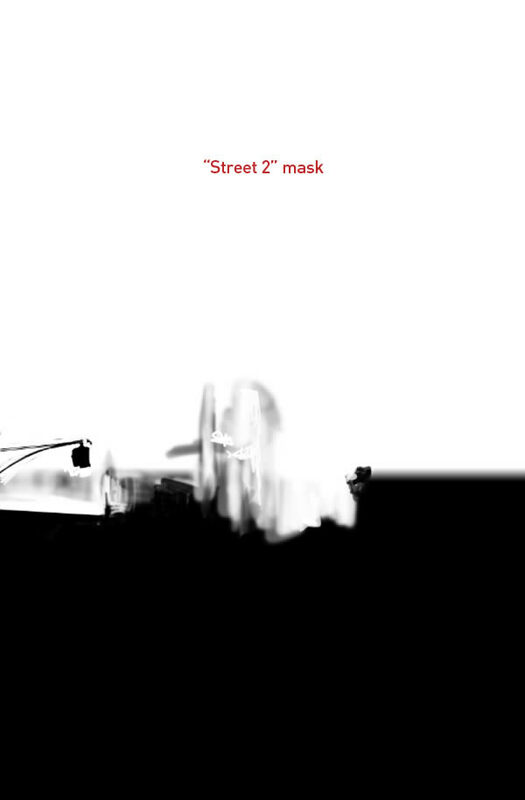 Ensure the “Building patch” mask is targeted, then paint within the selection with a small black brush to reinstate the street light. 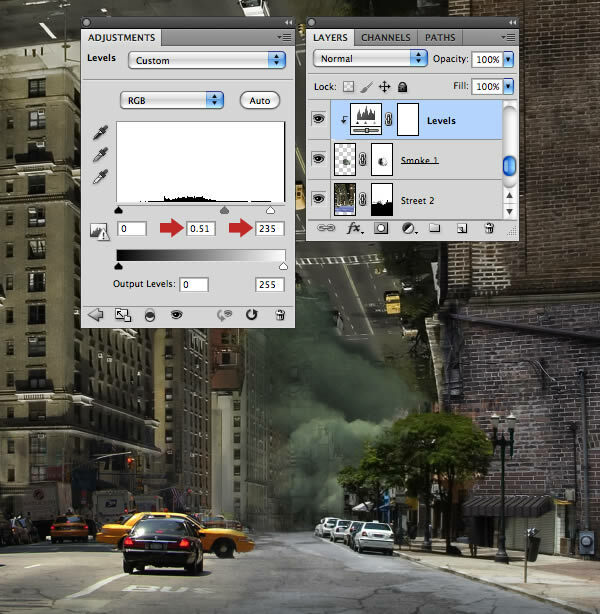 Use the same workflow as before to add some more smoke to the foreground above the “Base grad” layer. 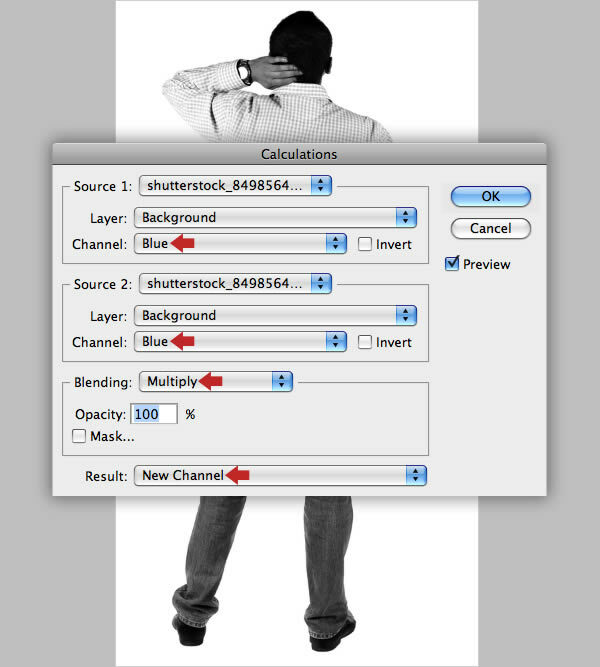 Merge to one layer, then Clip a Levels Adjustment as shown. Over the next few steps I’ll show you how to create some exploding concrete brushes. Open a photo reference and hit Control-I to Invert the image to negative. 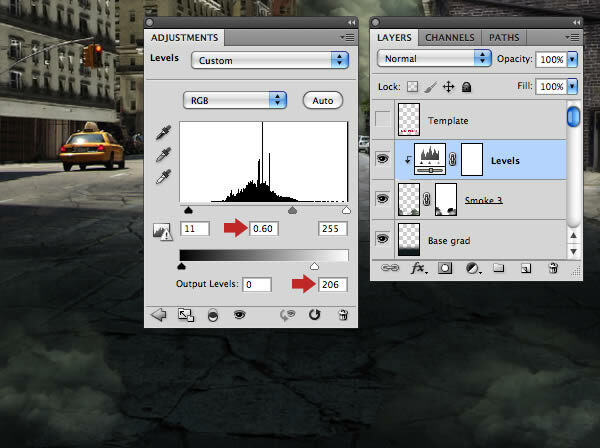 Now hit Control-L to access the Levels window and copy the following settings. Grab the Lasso Tool (L) and roughly encompass the central area, then press Shift-F6 to access the Feather window and enter 8px. Go to Edit > Define Brush Preset and name it in the following window. Repeat this for the remaining chalk photos. Use the Color Picker to sample a dark grey from your image, then use your new brushes to add exploding debris on a couple of New Layers below your “Template”. 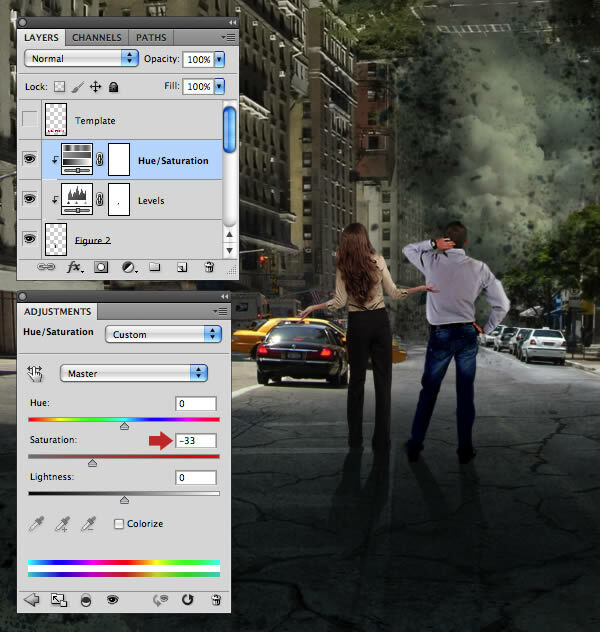 Name these layers “Debris 1” and “Debris 2”, then change the top debris layer to Soft Light for a subtle effect. 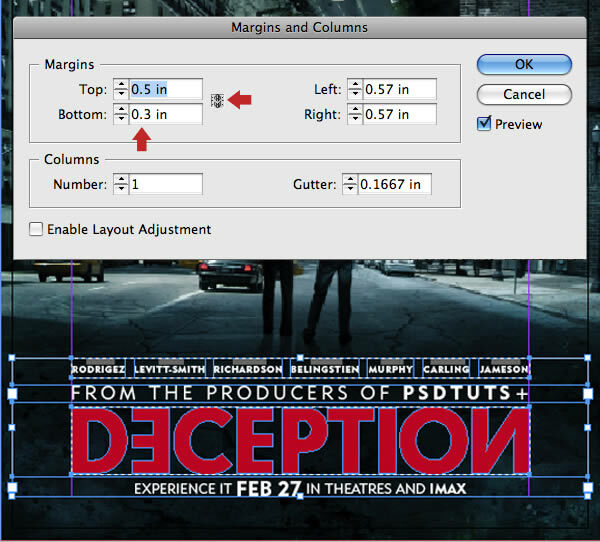 Place an empty layer below the “Template” and label it “Distortion”. Go to Image > Apply Image, set the Blending to Normal and click OK in the next window. You’ll now have a composite layer made up from all visible layers. Hit Shift-Control-R to access the Lens Correction Filter. By default the top Remove Distortion Tool should be active. Drag from the centre out to distort the buildings as indicated by the yellow lines. When you’re happy click OK to accept the filter. 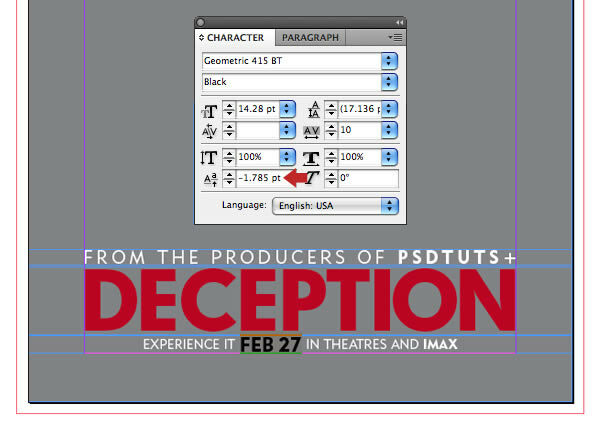 Add a Mask to the “Distortion” layer and hide the bottom half as shown. 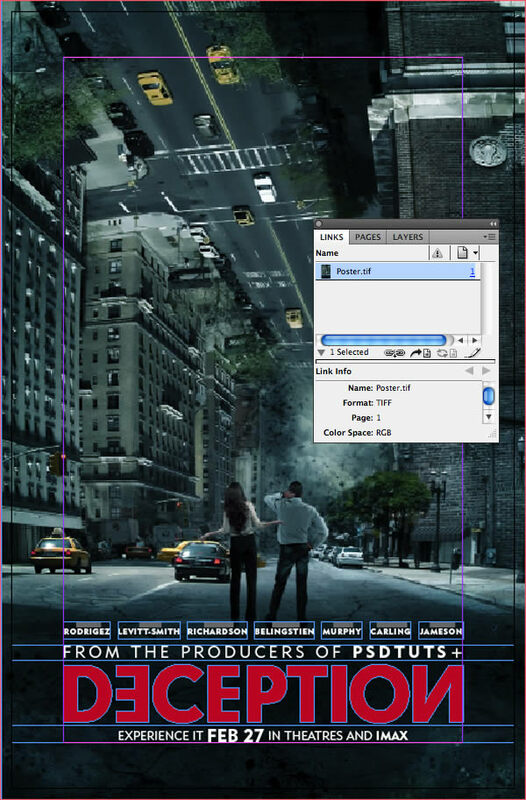 To keep your layers organized, highlight the “Distortion” layer thumbnail, then hold Shift and highlight the “Street 1” thumbnail (this will highlight all the in-between layers too), then choose New Group from Layers from the top-right fly-out menu in the Layers panel. Name the folder “BACKGROUND” in the following window and click OK.
Open the first figure. To isolate the subject precisely from the background we’ll use a channel or density mask. If you’re familiar with my tutorials it’s a technique I often use. Choose Image > Calculations, Copy these settings in the following window and click OK. This will create a composite channel with the most contrast between the subject and background. Switch to the Channels tab and you’ll see the new channel (“Alpha 1”) sitting at the bottom. Target it, then press Control-L and apply the following Levels Adjustment to increase the contrast. 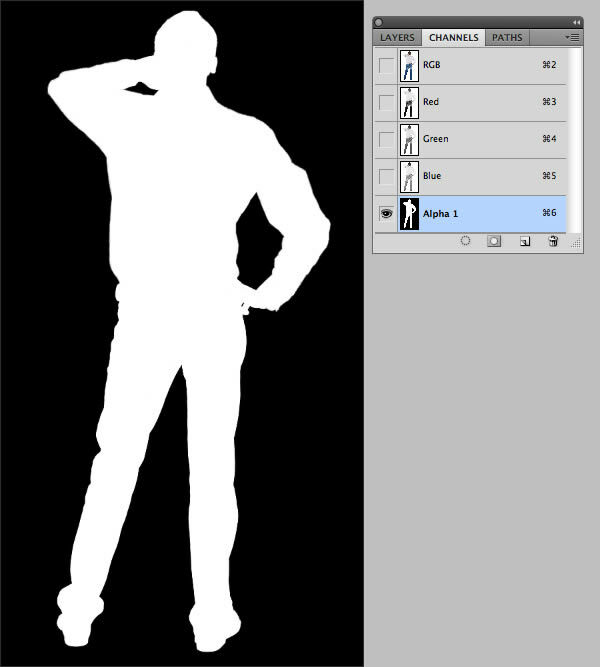 The idea is to produce a clean silhouette, so darken the inner of the model with the Burn Tool (O) set to Exposure: 70% / Range: Midtones. Now use a small hard-edged black brush to infill the remaining white shirt. By default, white acts as selective areas, so hit Control-I to Invert the channel to a negative. Your completed channel mask should now look like this. Control-click the “Alpha 1” thumbnail to generate a Selection, then highlight the top RGB channel. 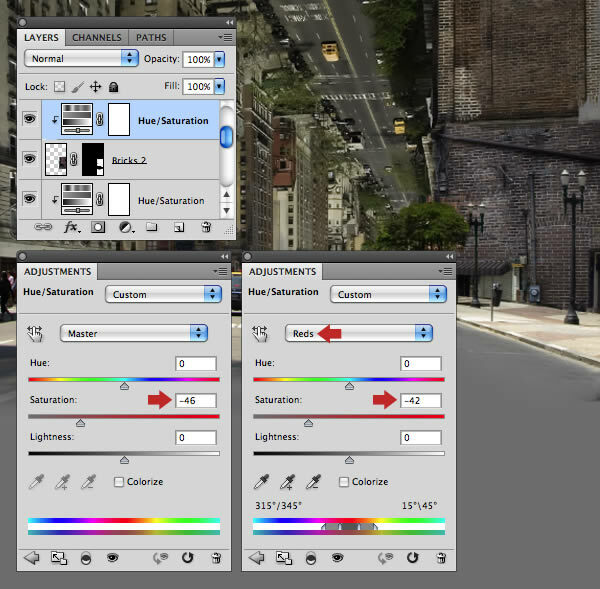 Switch to the Layers tab, then choose any Selection Tool and click the Refine Edge button in the Options bar. In the next window choose On Layers (L) from the View Mode drop-down menu, copy these settings and click OK.
You’ll now see a Masked Duplicate Layer appear and the visibility of the original layer disabled. Drag the mask thumbnail into the trash icon and click Apply in the following window. 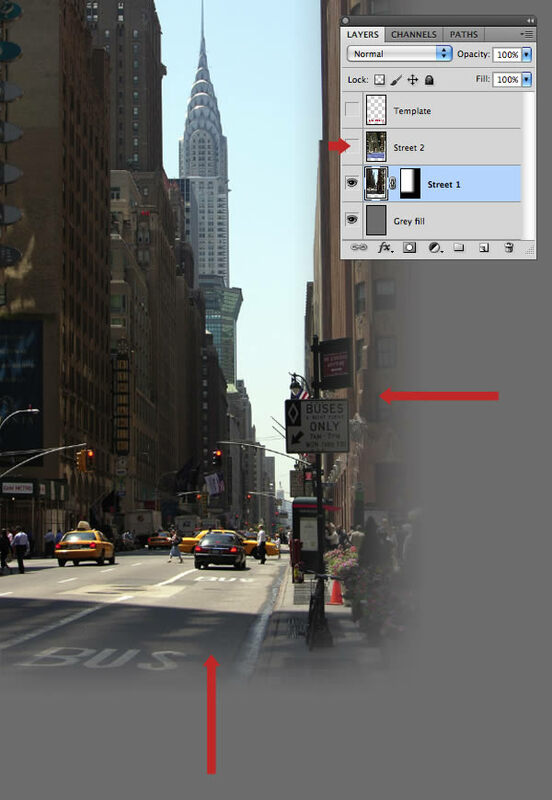 Drag the isolated layer above the “BACKGROUND” folder, Resize and place centrally in the road. Name this layer “Figure 1”. 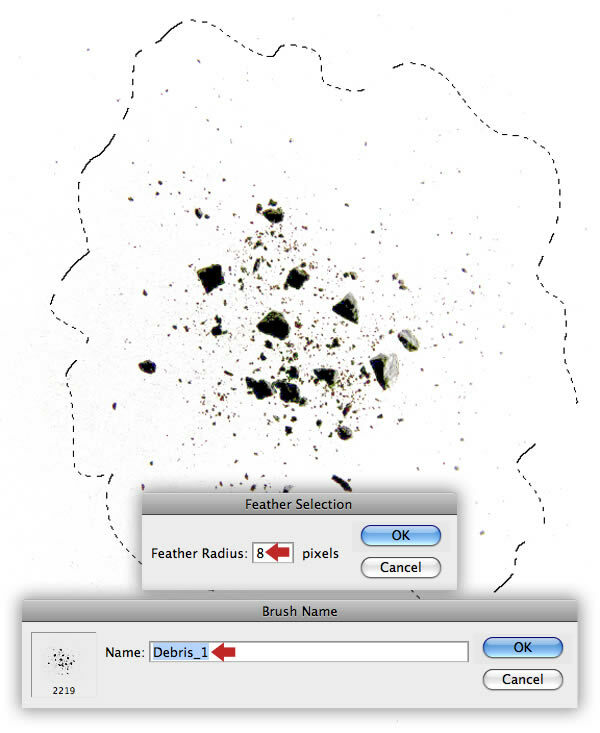 Control-click the “Figure 1” layer to generate a layer-based Selection. Add a New Layer below it in Multiply Mode and Fill with black. 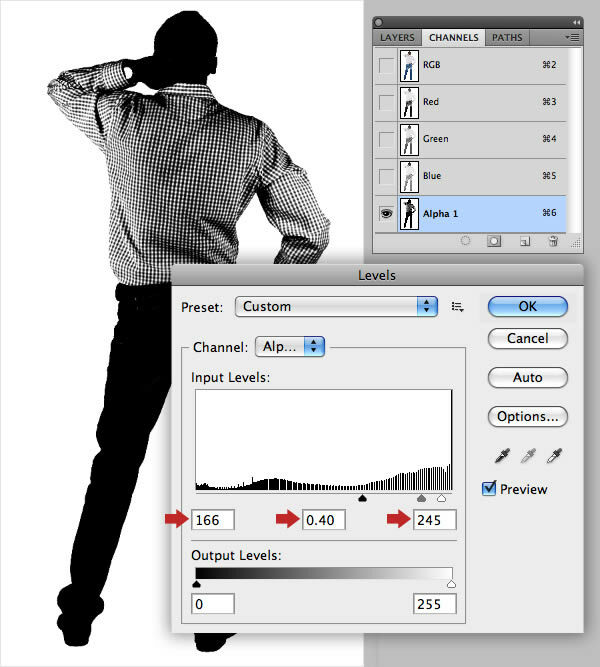 Pull the top middle control point down to create a cast shadow, then hold Control and distort as indicated. Name this layer “Figure 1 shadow”. Choose Filter > Blur > Blur More, then hit Control-F to repeat the filter. Next, break up the shadow with a little noise as you did with the gradient. Clip a Levels Adjustment to the “Figure 1” layer to increase the contrast and darken the highlights. Now target the Adjustment Mask icon and paint with a small, black soft-edged Brush to bring back the lighter tones around the edge as shown. Use the same techniques to extract and place the second figure. 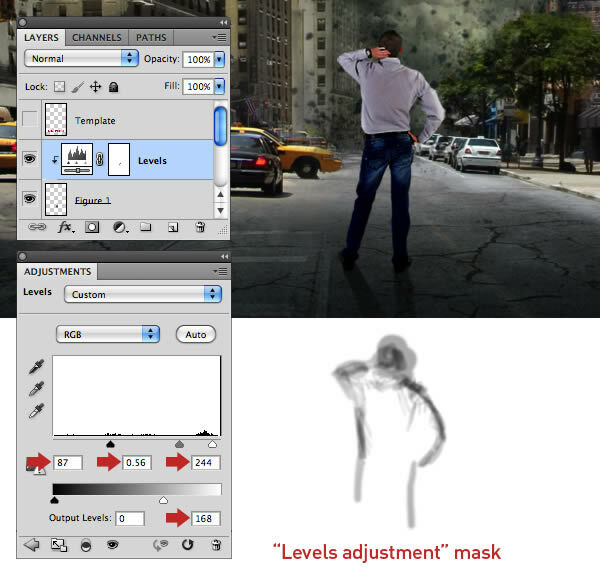 Add a cast shadow layer, then Clip a Levels Adjustment to the figure and modify its mask accordingly. Both figure shadow layers can now be masked with an angled Linear Gradient (G). As a final modification, clip a Hue/Saturation Adjustment to “Figure 2” and reduce the overall Saturation to -33. 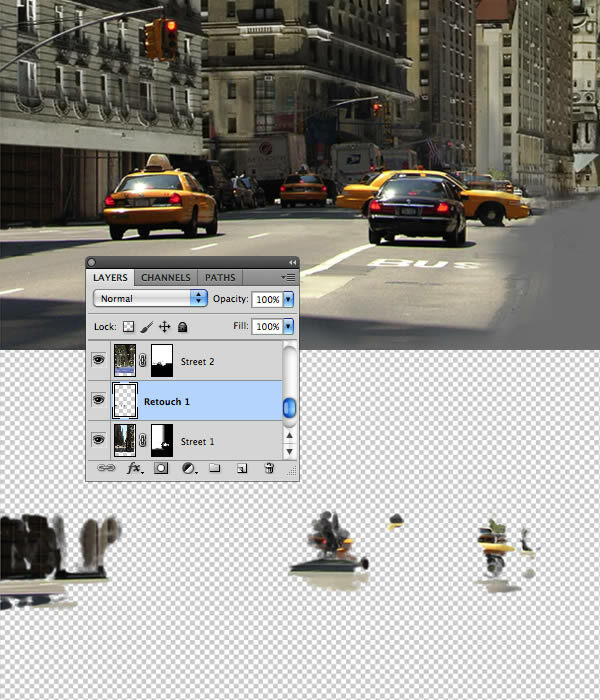 Place both figures, including their shadow and adjustment layers into another Group called “FIGURES”. With the image nearing completion, it’s time for some overall color and tonal modifications. 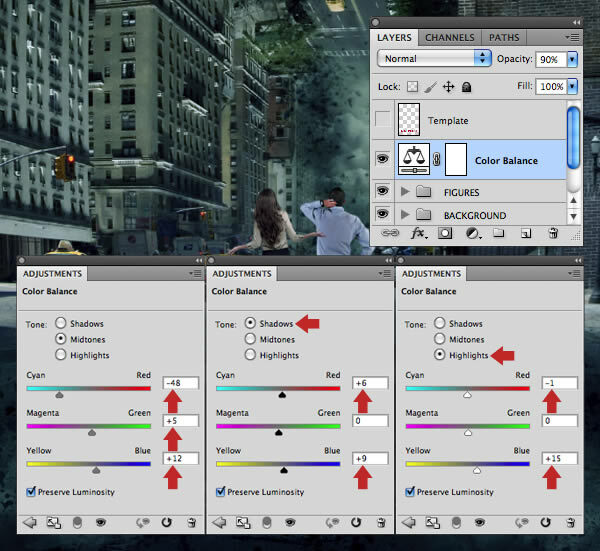 First, place a Color Balance Adjustment below the “Template”, copy these settings and click the Double-ring icon to Unclip it so as to affect all layers. 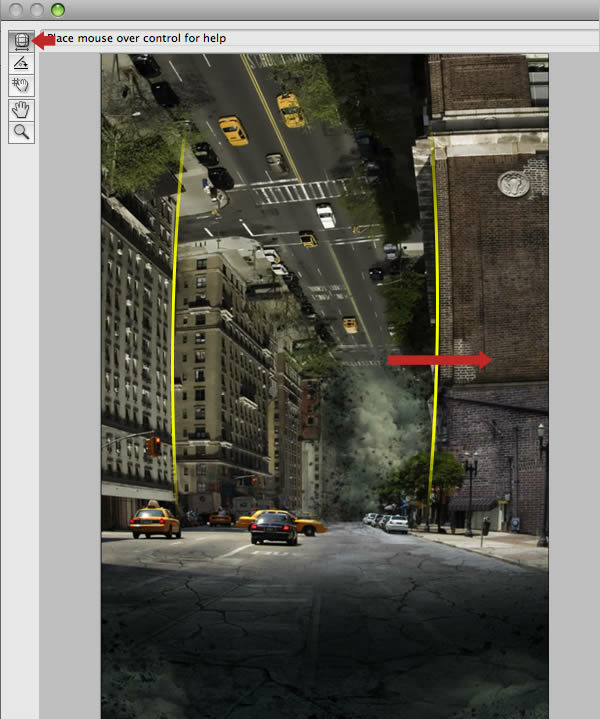 Now lower the Adjustment Layer’s Opacity to 90%. 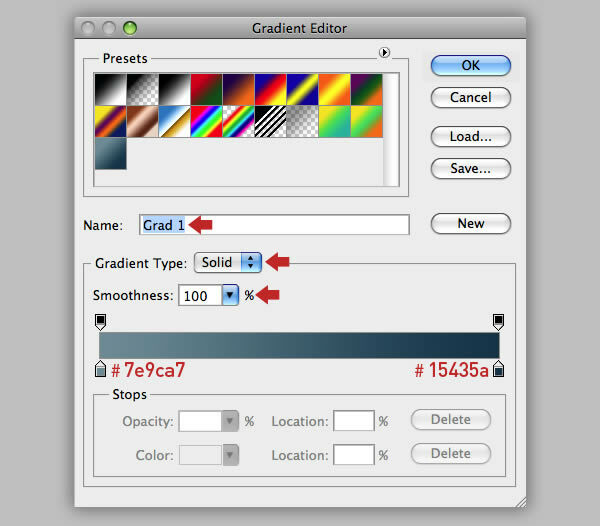 Select the Gradient Tool (G), then click the Gradient Swatch in the Options bar to open the Gradient Editor. Click each Color Stop, then the color chip in turn to create and Save a New Gradient as shown. Use your gradient preset to add an unclipped Gradient Map Adjustment Layer above the previous one, then change the Blend Mode to Soft Light and reduce the Opacity to 60%. 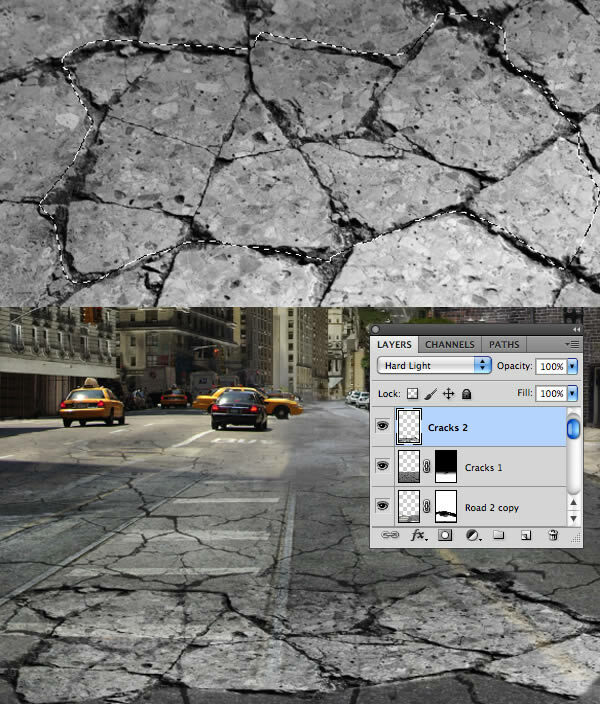 Open grunge images and Shift-drag its layer thumbnail above the last adjustment layer. Name this layer “Distress”, change the Blend Mode to Soft Light and reduce the Opacity to 62%. Add a Mask to the “Distress” layer, then drag a series of black to transparent Radial Gradients to hide the central area. At this point I wanted to draw more attention to the distant billowing dust and debris. Target the “Distortion” Layer Mask and use the same Gradient technique to reveal more of the original smoke layers. I also felt the figures needed some more work. Place a New Layer in Multiply Mode at the top of the stack within the “FIGURES” folder. 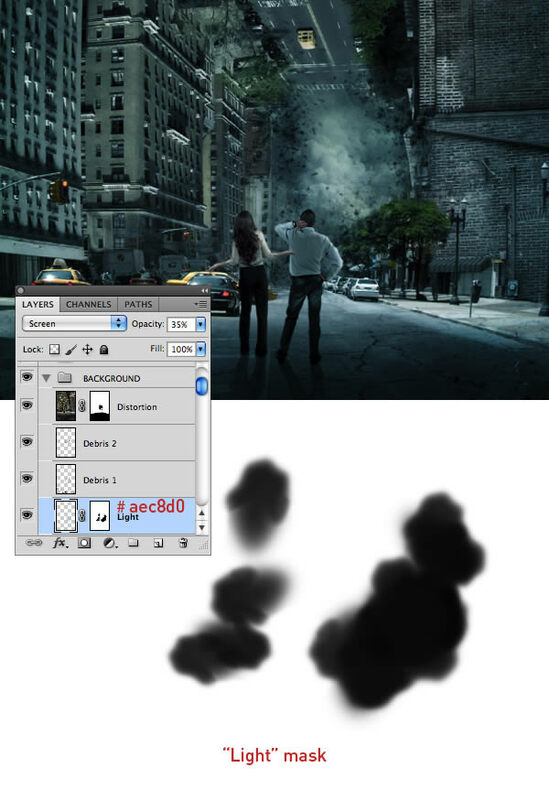 Sample a dark grey (#11242b), grab a small soft-edged brush and paint over the figures at 50% Opacity. 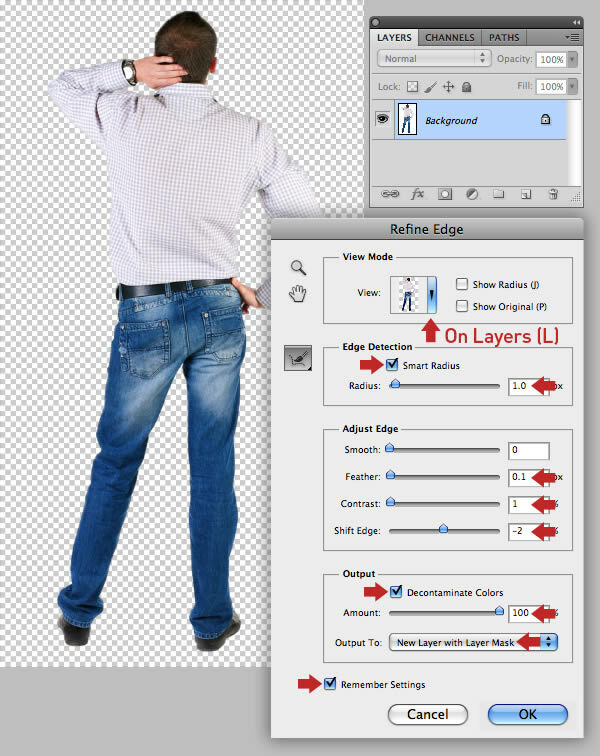 You can now use Inversed layer-based Selections to mask as required. Add a New Layer below “Debris 1”, pick a pale blue (#aec8d0), then drag a Radial Gradient from the center out. 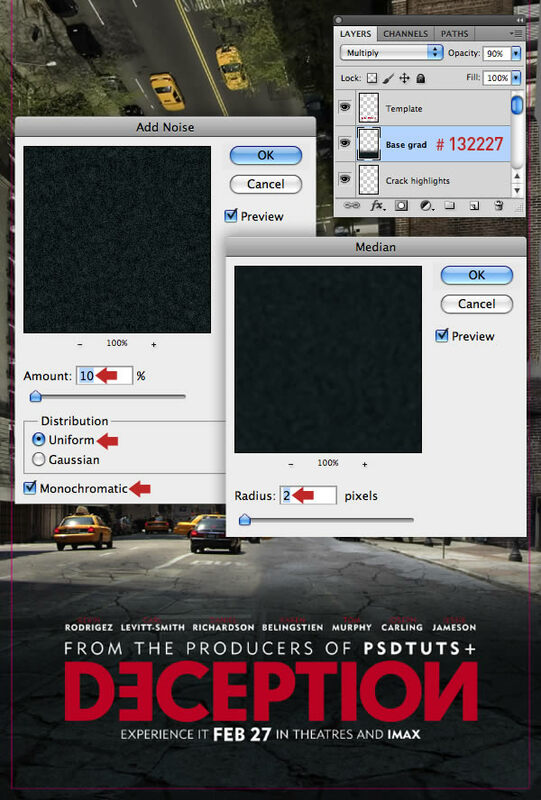 Add a little noise, then set the Blend Mode to Screen and the Opacity to 35%. 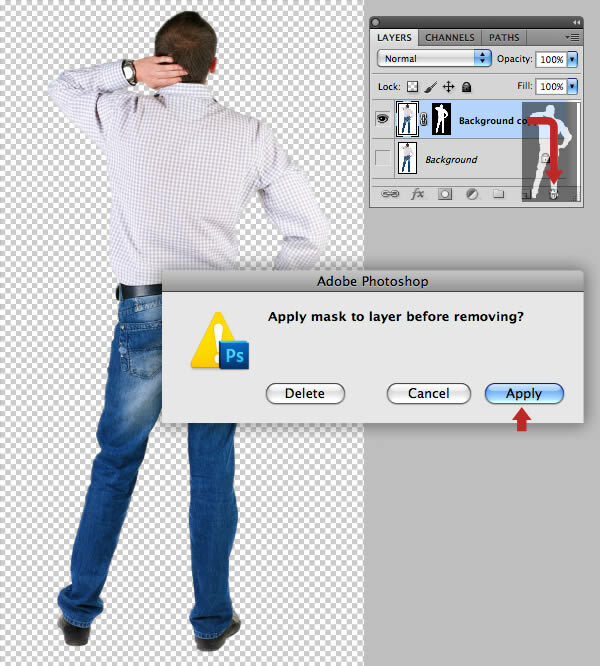 This layer can also be masked as shown. 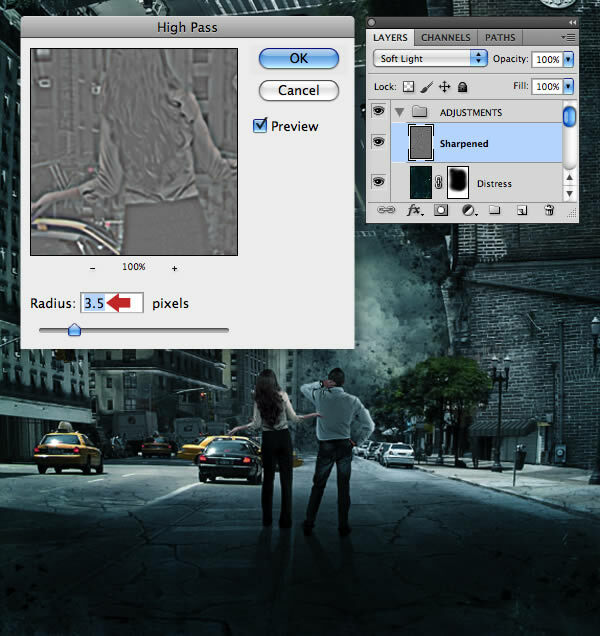 Repeat the Apply Image command to create a new composite layer above the “Distress”. 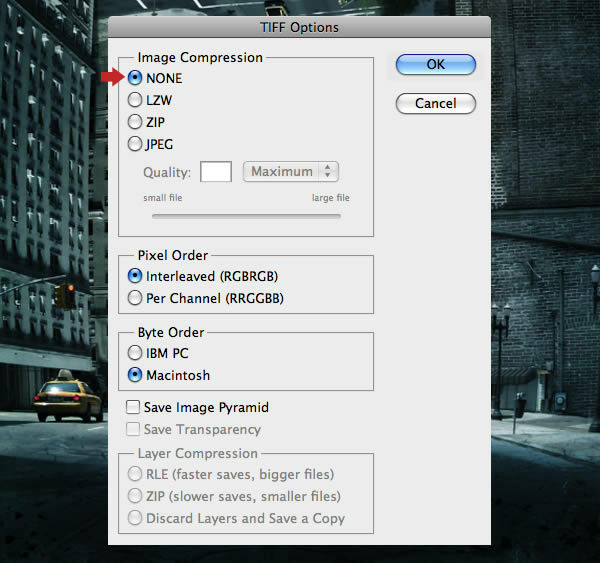 Choose Filter > Other > High Pass and enter 3.5px. Name this layer “Sharpened”, then add all the floating layers within another folder called “ADJUSTMENTS”. The “Template” layer is no longer required so Delete it. That’s it, the image is now finished, so be sure to save it as a layered file, then Flatten and Save As a TIFF. 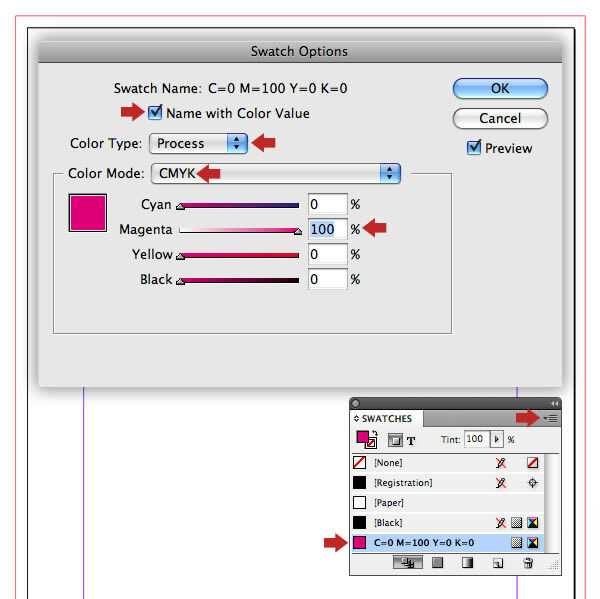 Revisit your InDesign artwork and Delete the magenta stroked box. Press Control-D to locate your TIFF, then snap it to the outer bleed box. Now hit Shift-Control to open bracket to Send to Back. If you feel there’s too much border at the base, bring up the Margins and Columns window, modify accordingly, then reposition your graphics accordingly. Now we’ll add some wear and tear to title. Select and Copy it to the Clipboard, then create a new Photoshop document accepting the Clipboard preset with the Background Contents set to Transparent. Paste and the heading will appear as a Vector Smart Object. 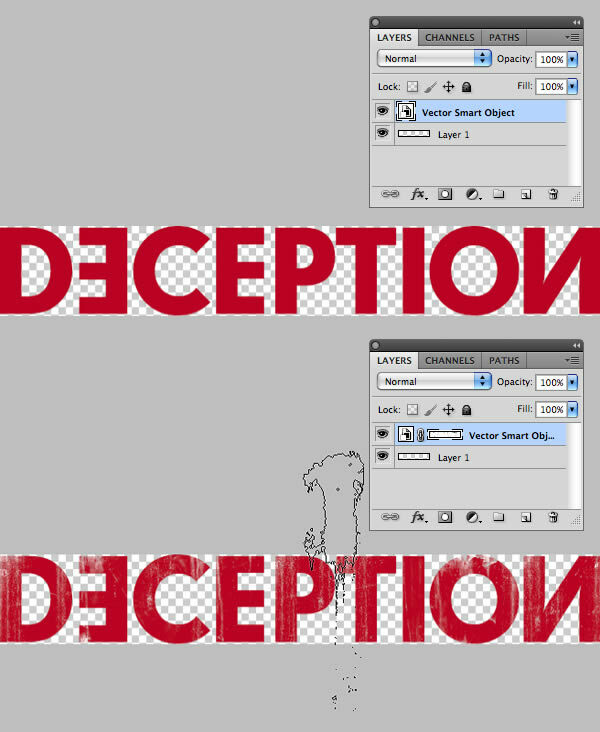 Add a Mask, then use an assortment of custom Brushes to erode the lettering slightly. When you’re done save as a PSD file. 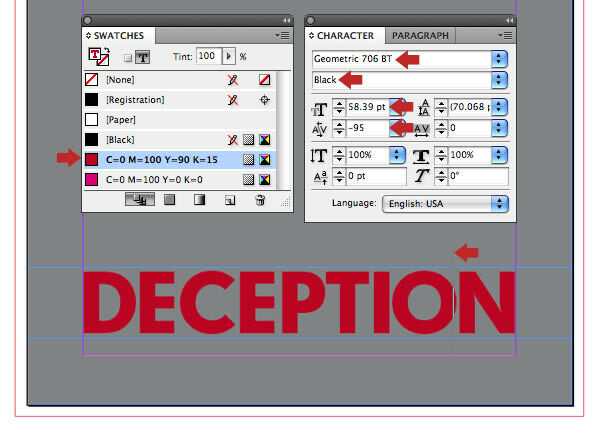 Switch back to your InDesign document and make a note of the heading’s Y coordinate in the Options bar, then delete it. Now press Control-D again and place your PSD heading. I also chose to recolor some of the text using a new pale blue/grey swatch. 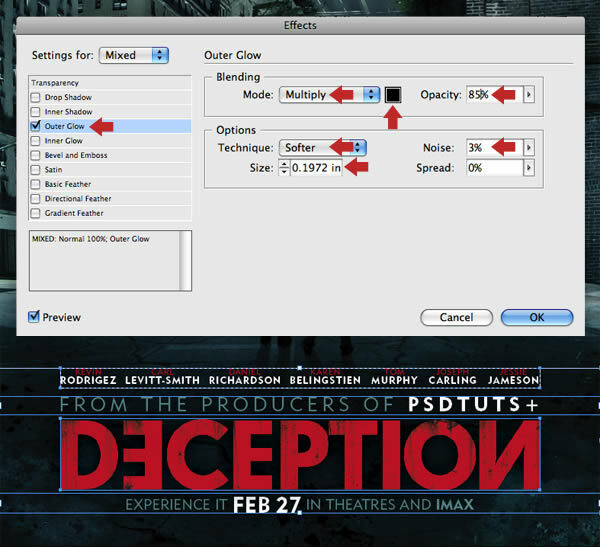 To complete the poster artwork, select all your text boxes and the heading graphic and go to Objects > Effects > Outer Glow and copy these settings. You could even make second version of your poster by simply Rotating the illustration as shown below! 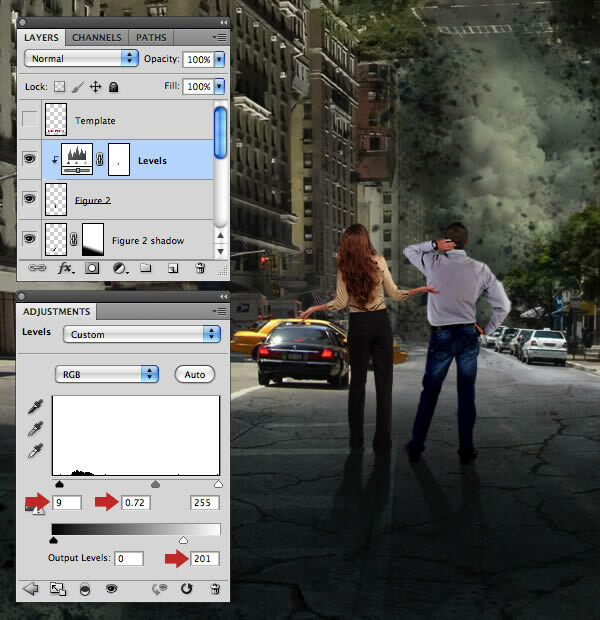 Create mind blowing cinematic effects just like the movies. Browse the incredible selection of Cinematic Photoshop Actions available through GraphicRiver to start creating awesome effects today. Use these actions for your designs and check out one of our favorites below! 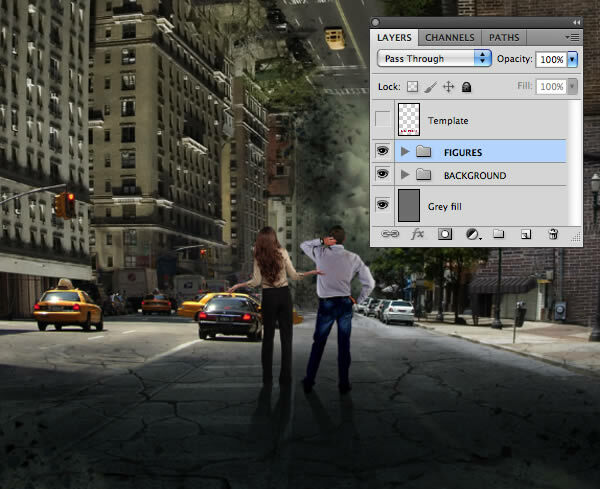 This sweet Photoshop bundle is jam-packed with dozens of awesome cinematic actions. 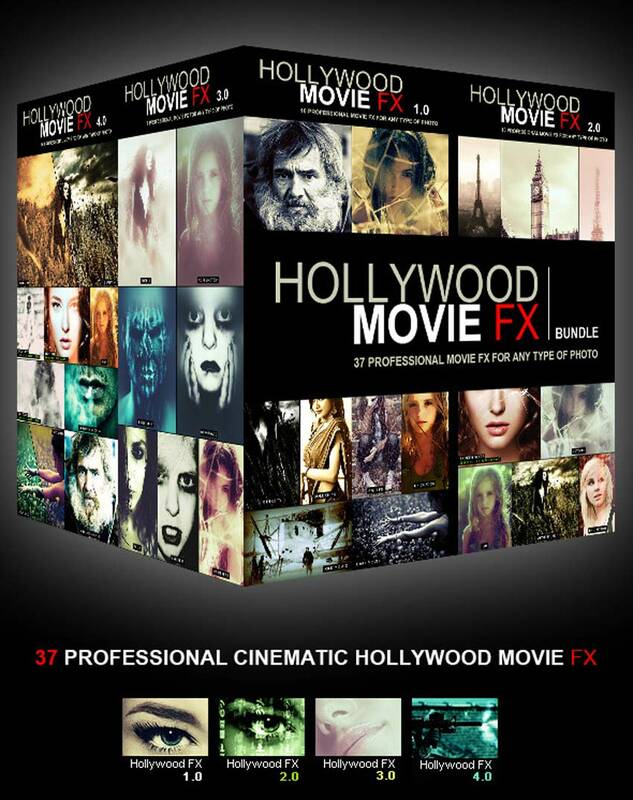 It includes 37 Hollywood-inspired movie effects all for one low price! 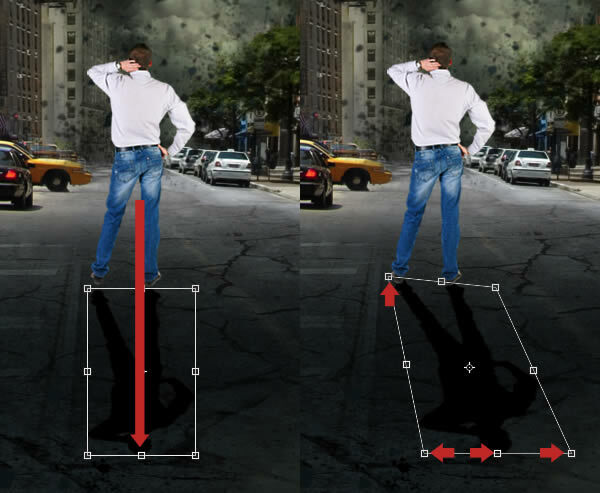 Use these actions to create amazing cinematic effects with non destructive editing.